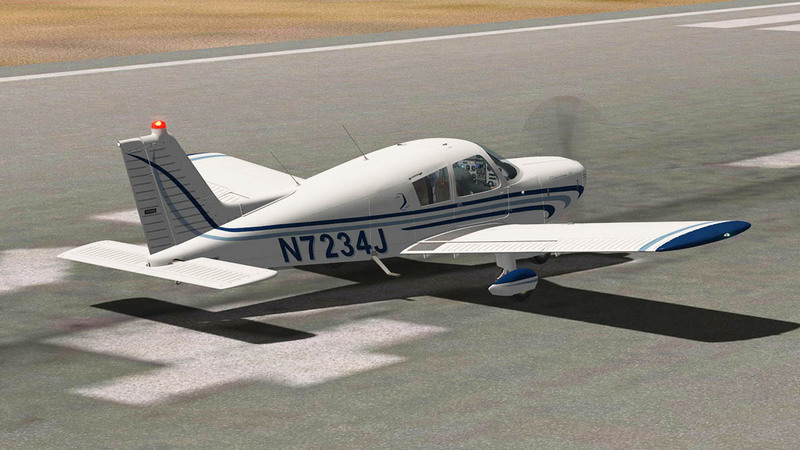 In the early sixties Piper Aircraft needed a competitor to the runaway success of the Cessna 172 Series. 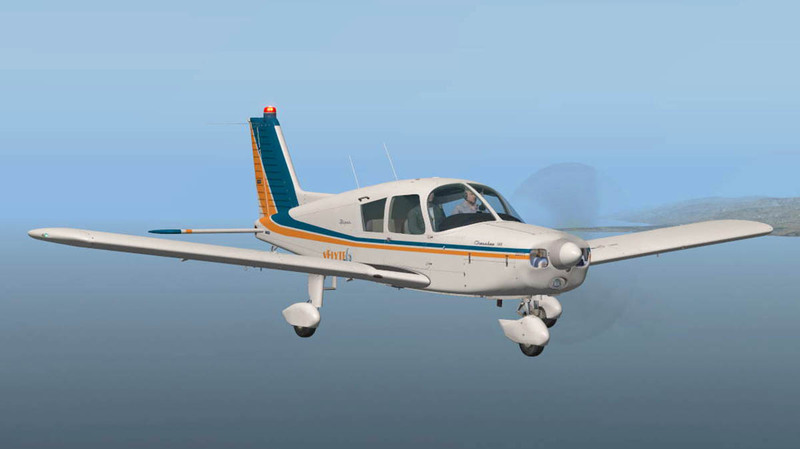 The company looked to their current but larger design in the Piper PA-24 Comanche and downsized the aircraft but also took away the retractable landing gear and its constant-speed propeller (These items would be later returned on future versions of the Cherokee). 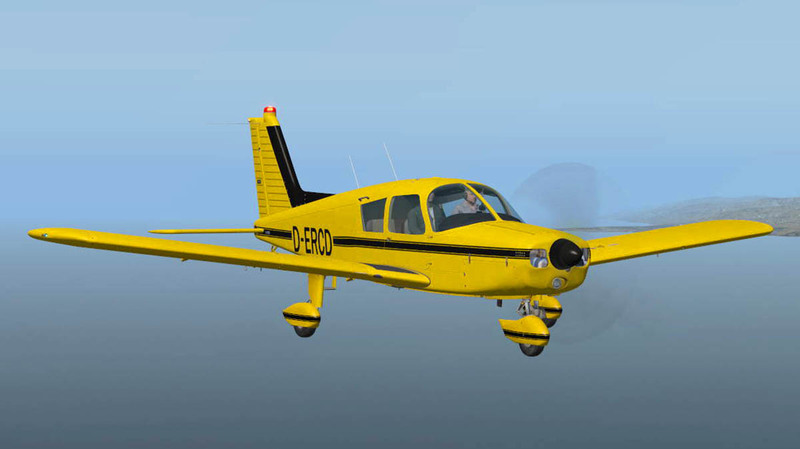 Overall Piper created a smaller, thriftier and cheaper version to bring the aircraft to the demanding market. Certainly 32,000 sales since the launch of the Cherokee in 1961 proves the wise decisions of the time. 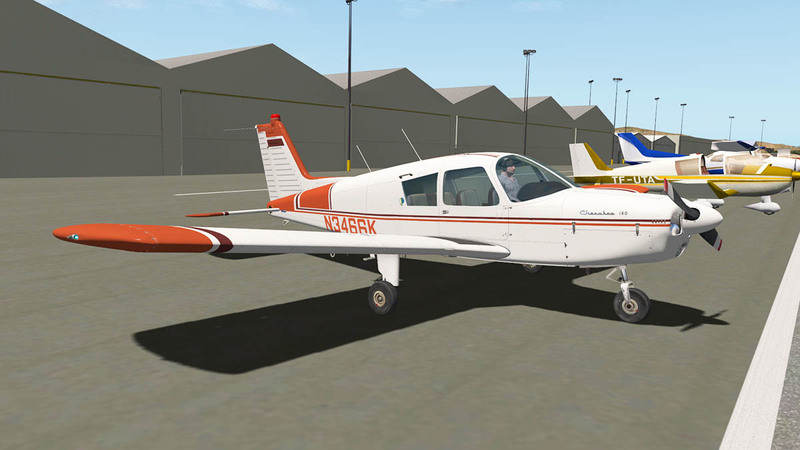 The original Cherokee was the 150/160 (PA-28-150 and PA-28-160) and the number denotes the horsepower rating. 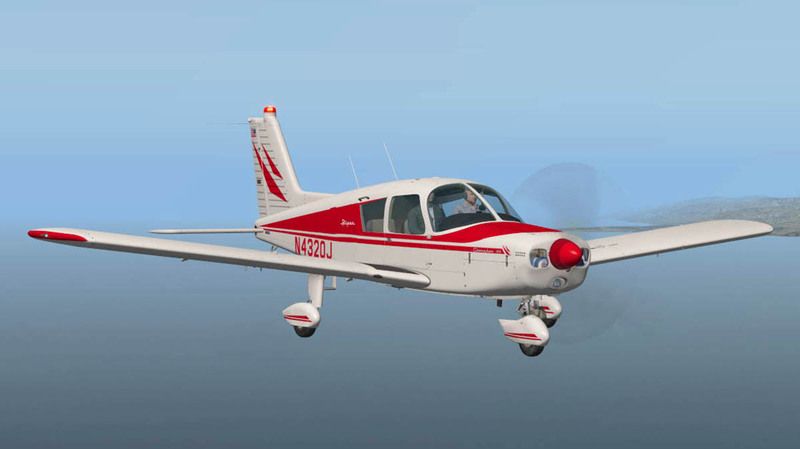 But very quickly into production Piper created the Cherokee 180 (PA-28-180) going higher in the market and then soon wanted even more flexibility in the lower end and the Cherokee 140 was created to fill that gap. 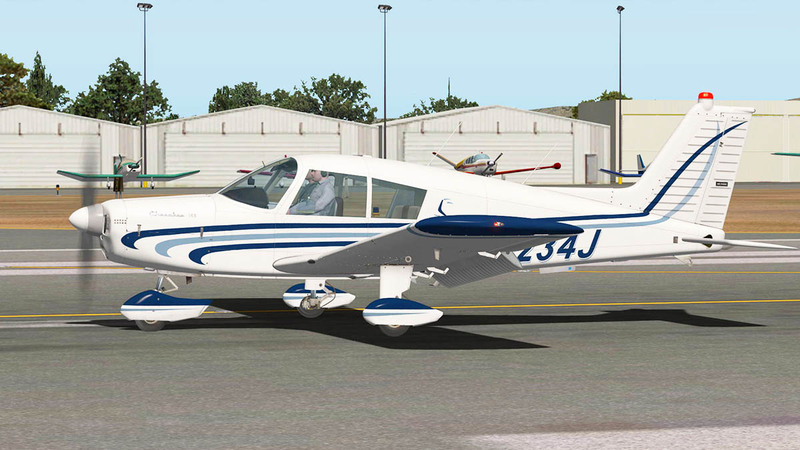 The 140 actually has the PA-28-140 engine but was slightly modified shortly after its introduction to produce 150 horsepower (112 kW), but still kept the -140 name. Early versions were only two seaters but this version is the 140 variant called the Cherokee Cruiser 2+2 with four seats. 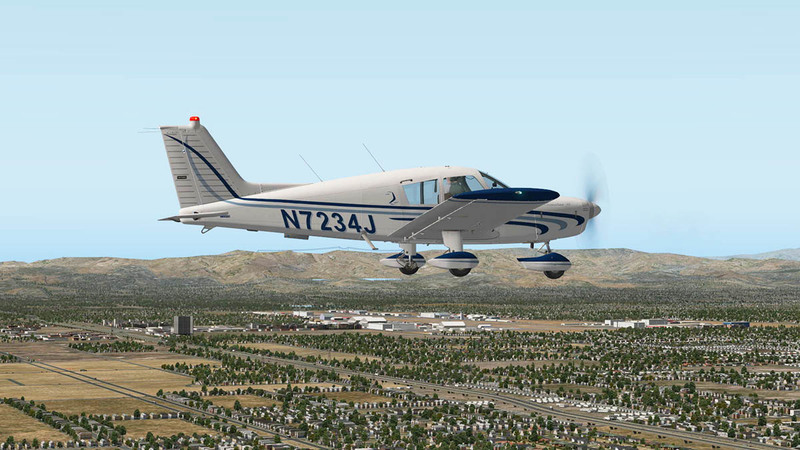 So X-PlaneReviews headed out to Van Nuys, California to check out the latest release from VFlyteAir in their version of the Cherokee 140. There are actually two versions on offer here in the Classic (C) or the Original (O). 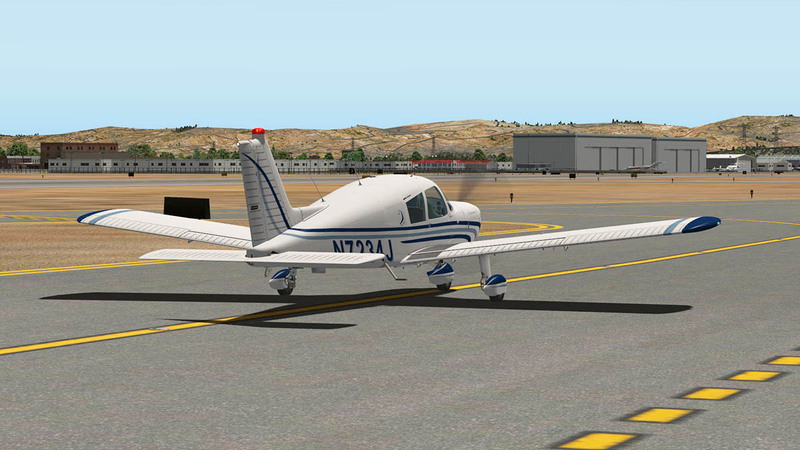 The Original is VFR (Visual Flight Rules) rated only and the Classic is a IFR (Instrument Rated) aircraft. 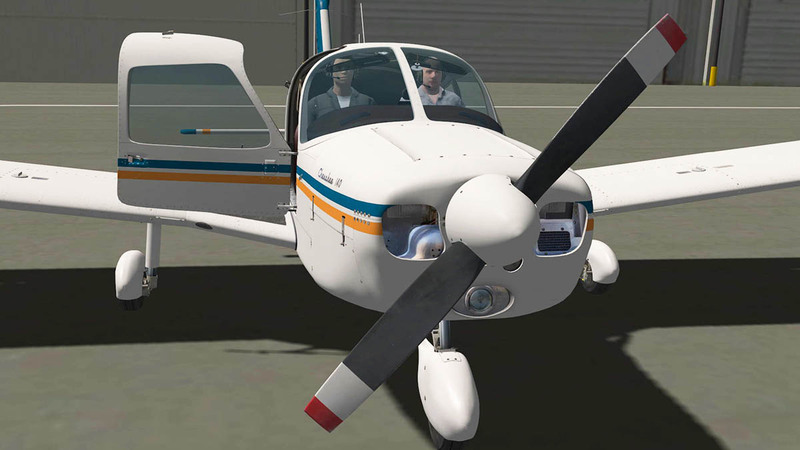 Externally both aircraft are exactly the same with only the panel and rating as the differences between the aircraft versions. So we will look at the Classic overall and then note the differences with the Original later. 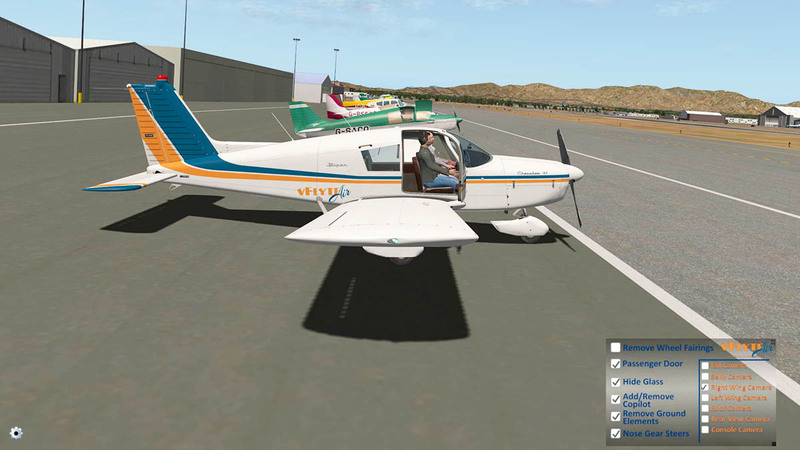 Their is a big correlation with VFlyteAir and the Cherokee 140 with the developer actually leasing the aircraft and flying the Cherokee regularly as do all the aircraft (beta) testers for this project. 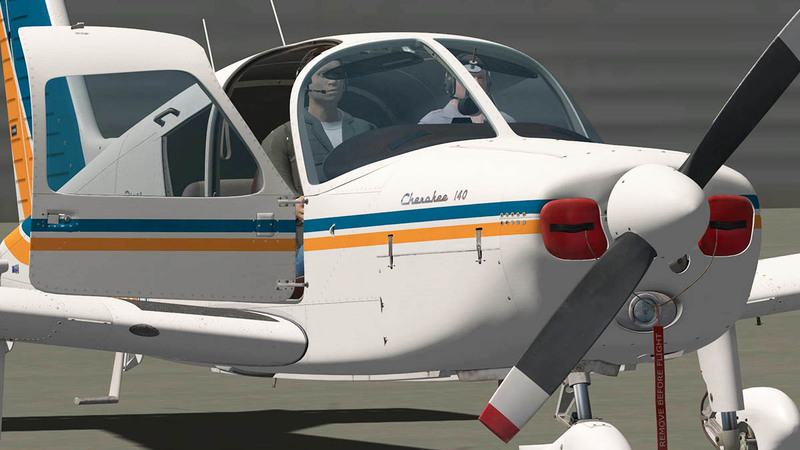 So there is an intimate connection with the design and its transfer to the X-Plane simulator. This is important to this review and this notable connection is certainly valid to the authenticity of the design. 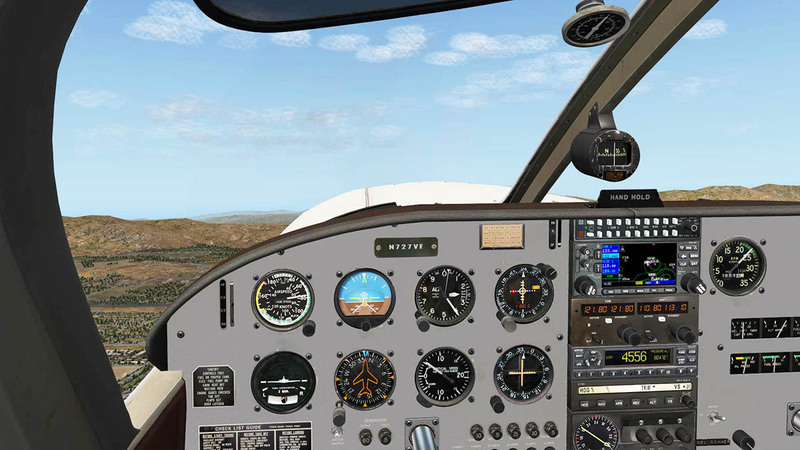 Having a donor aircraft available does certainly allow the designer more access to the modeling and dynamics of the design to be translated over to the simulator. 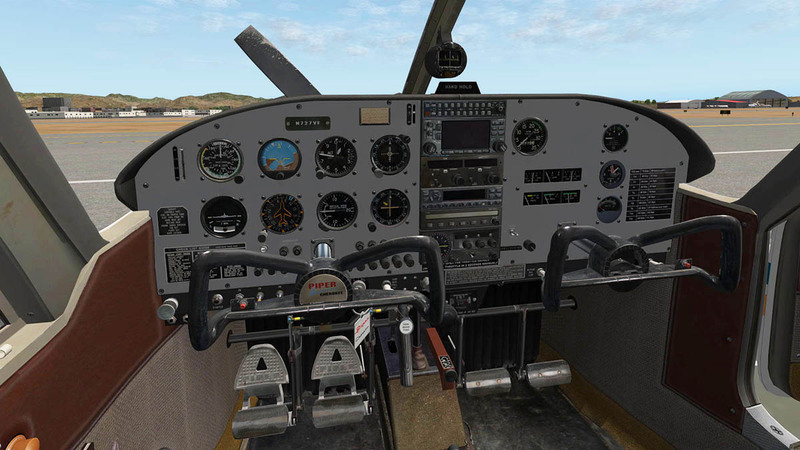 No doubt many developers pore over an aircraft with their tape measures and cameras, but having an aircraft you use is like knowing that small scratch on the rear bumper of your car is there and the seat runners stick every time you move the seat, annoying but part of the heart of the machine. 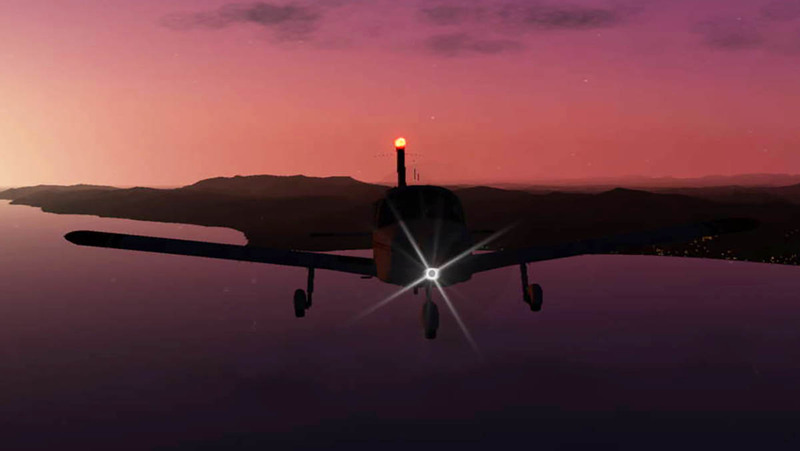 So this aircraft release is more than just another project for X-Plane for the team at VFlyteAir, it is their heart as well. First impressions are actually the opposite of the above. 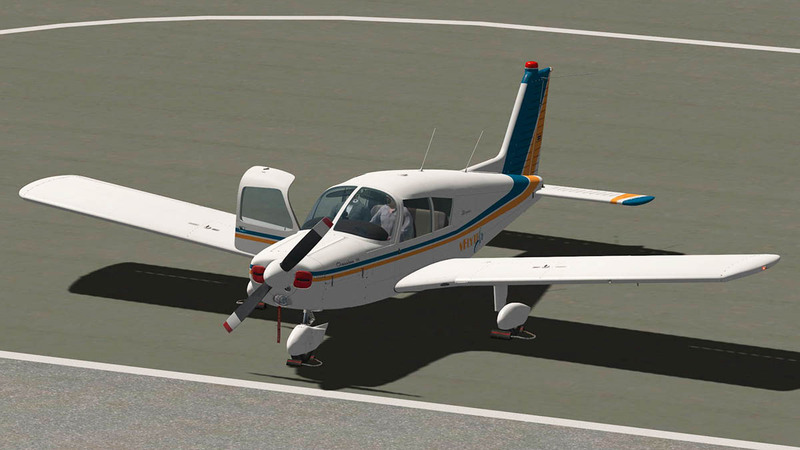 Yes the aircraft is minutely well modeled, great and even perfect design work, but... it feels a little bland. Is there anything missing here to make it better? The point is there isn't. 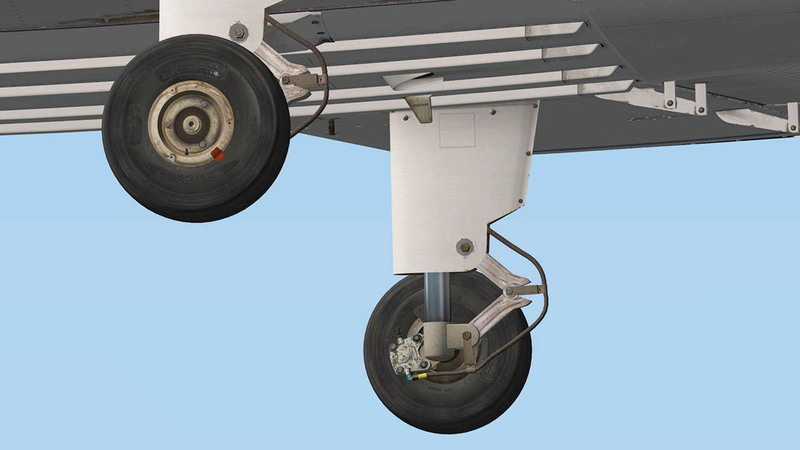 So you need to get in closer or more intimate with the aircraft and then you can feel the detailing. If one designer house has created a quality feel over the last few years then none have advanced more that VFlyteAir. Left lower of the screen is the cog for the pop-up menu. Standard it covers removing the wheel covers, opens the right side passenger door, adds or removes the Co-Pilot (and adjusts his weight as well, which is well done), removes the ground elements which is quite odd with the tick on to remove and off to add and feels the wrong way round. 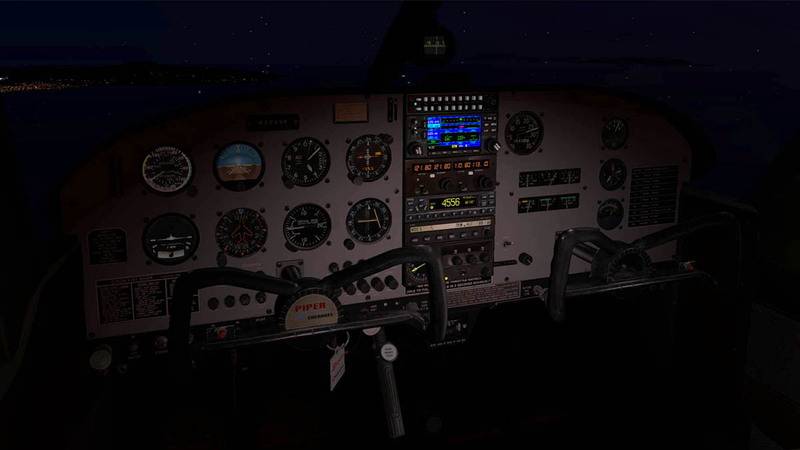 Final selection is the choice to use the X-Plane steering or an add on steering (home cockpits). Also on the menu are seven views (four views are displayed below) with six external and one internal which are all very good. Internally your first impression is of that feeling again of the panel being a bit bland, but bear with me. 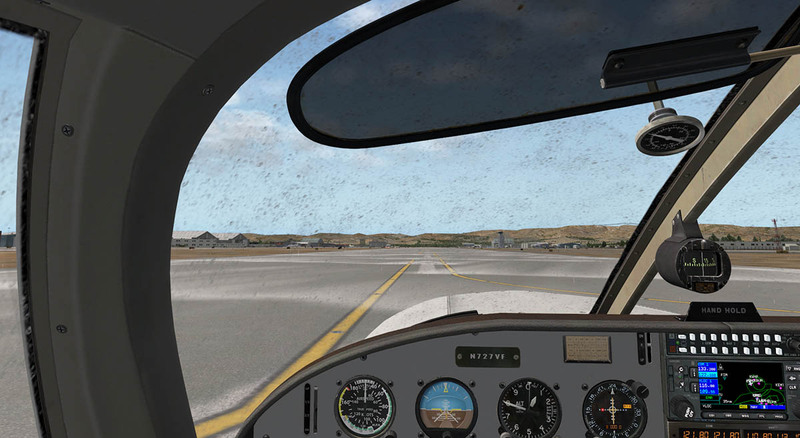 On the surface you look around you and feel the baseness of the aircraft, but then you start to get closer to the aircraft, you look harder at the detailing and sheer depth of what you are feeling here. The deeper you go the more you realise this aircraft is very, very detailed, perfectly detailed and nothing is missing or looked over. 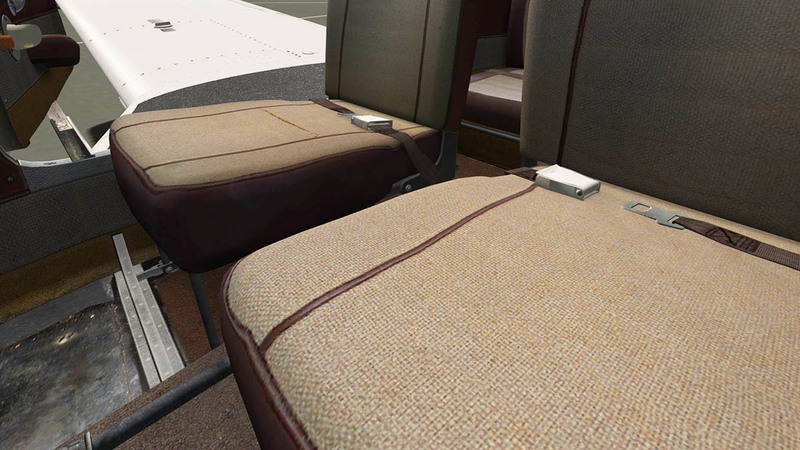 Textures are excellent, you can almost feel the weave of the material on the seats that worn rip on the Co-Pilots fabric, the tired worn side panels and old leather inserts. Fuel tank switch is low down on the left panel and the air vents are perfectly recreated, and they rotate as well and does the small air adjuster knob. And this is where you are getting into the real feel of the aircraft because the longer you are in here, and the more you look... then you realise how very well it is all done and put together. 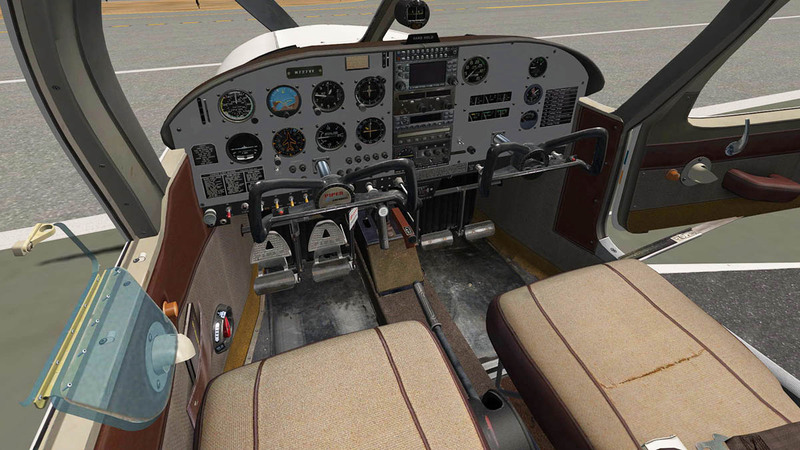 The metal heel pans are perfectly damaged and worn with years of use, as are the rudder pedals, and all the intricate assemblies under the panel is perfectly created for authenticity. 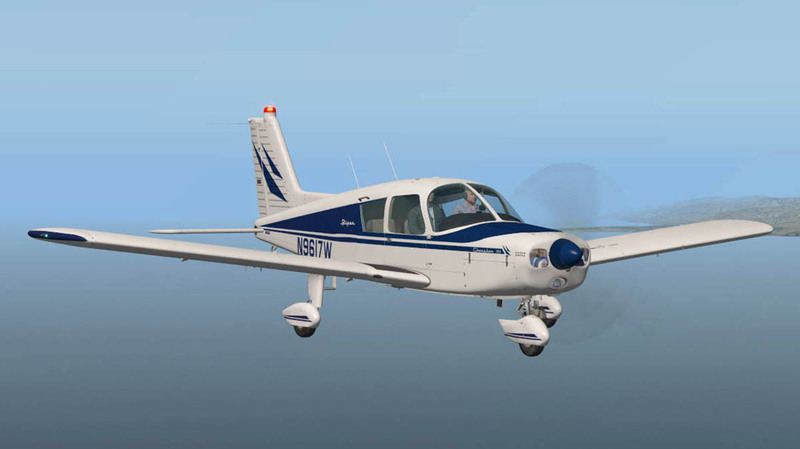 Roof mounted pitch trim handle is excellent but really hard to use in flight with no way to watch the instruments when adjusting the trim. Lovely worn metal yokes continue the vibe, but I really like the right side yoke in missing the centre plaque with age. 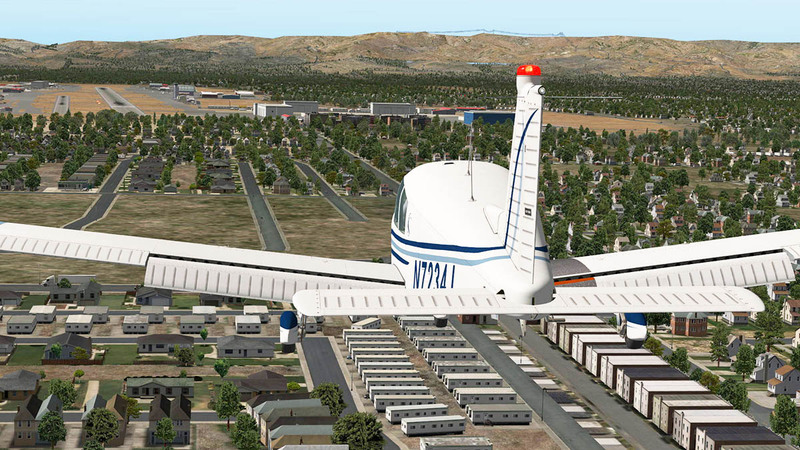 Just like your real time used aircraft. Both yokes can be hidden for full panel viewing. First view of the panel felt underwhelming. But again the detailing and experience came out with closer observation and use, the more you use the aircraft and fly this machine then the more you feel a distinct part of it, there is some strange background business going on here. 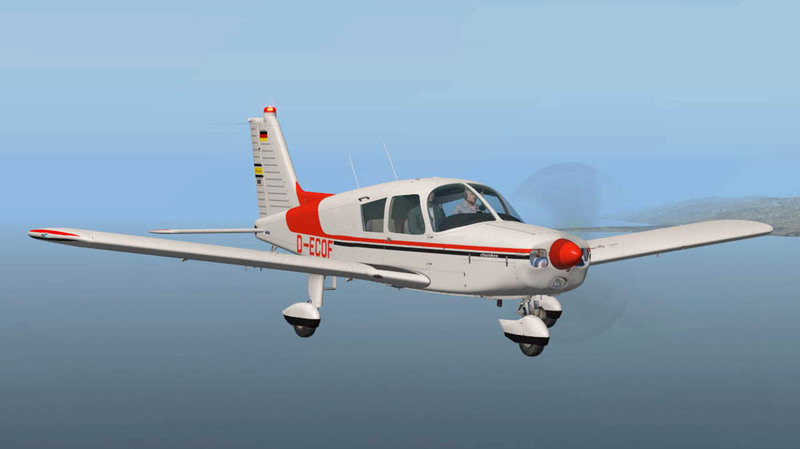 My feeling is that with the intimate use and a closeness to the real Cherokee 140 then this feeling as in no doubt was the total objective of this aircraft, and to transfer that consciousness to the user on that basis. I think VFlyteAir have succeeded in that process. The panel layout is basic in design. 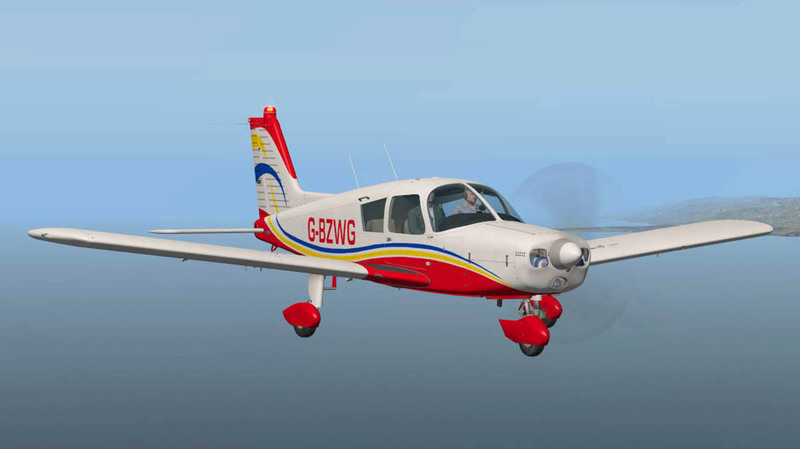 This aircraft was created initially for the flying school and weekend flyer markets, so it is not ever going to be a sophisticated machine. 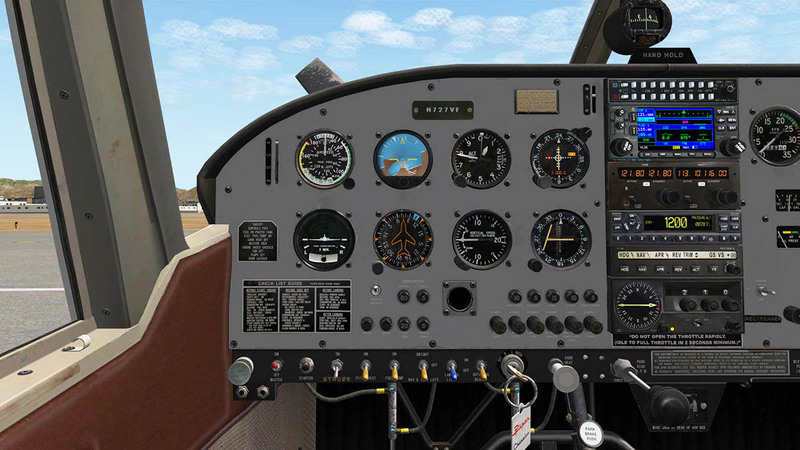 Standard six instruments (Airspeed Indicator, Attitude Indicator or Artificial Horizon, Altimeter, Turn Coordinator, Heading Dial and Vertical Speed Indicator are perfectly laid out, with directional CDI (course deviation indicator) for VOR OBS (Nav2) and ILS alignment Dial are all clear and nice to use. 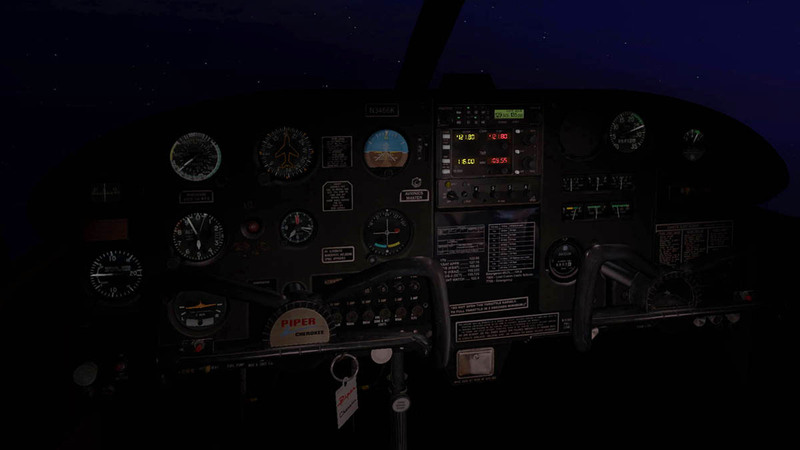 Lower panel are the lighting switches and pitot, fuel pump switches. Left side of the panel is quite bare but has the engine monitoring instruments in RPM (large), Gyro suction dial, Clock and voltage meter. Six engine gauges in a block cover left and right fuel tanks, amperage, oil pressure, temperature and fuel pressure. Centre equipment stack is excellent. Standard KMA 28 TSO Audio set is top with the Garmin GNS 430 below. 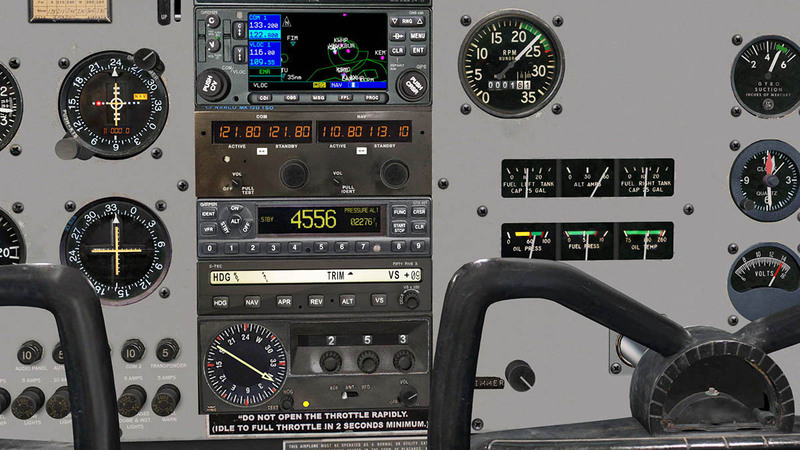 Then you have a Narco MK 12D NAV/COMM (COMM2/VOR 2) that runs the Glideslope dial on the panel. Garmin GTX 327 transponder with built in distance indicator is above the unique S-TEC 55X autopilot. Another unique unit is the King KR86 ADF unit with built in direction pointer, which is amazingly easy to use. So the equipment stack does give you great functionality if you want to cruise somewhere beyond your immediate area and cover some distance. 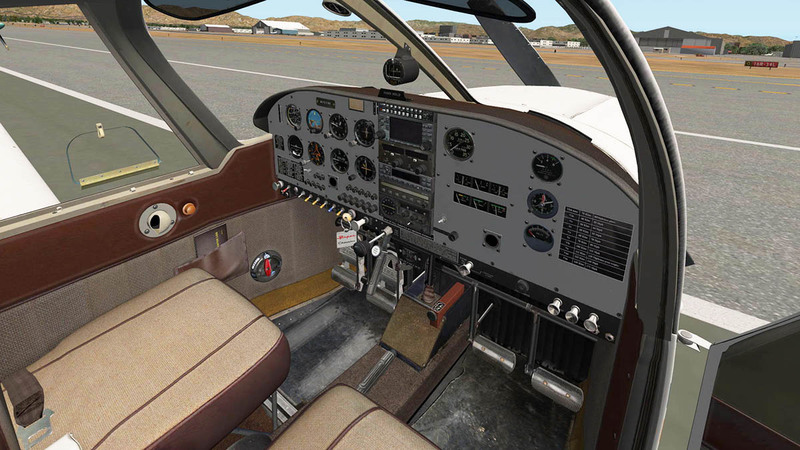 The VFR original version and panel is very different from the Classic version, It is the layout and replica of the donor aircraft N3466K. A compass left and a clock centre fills up the spaces. 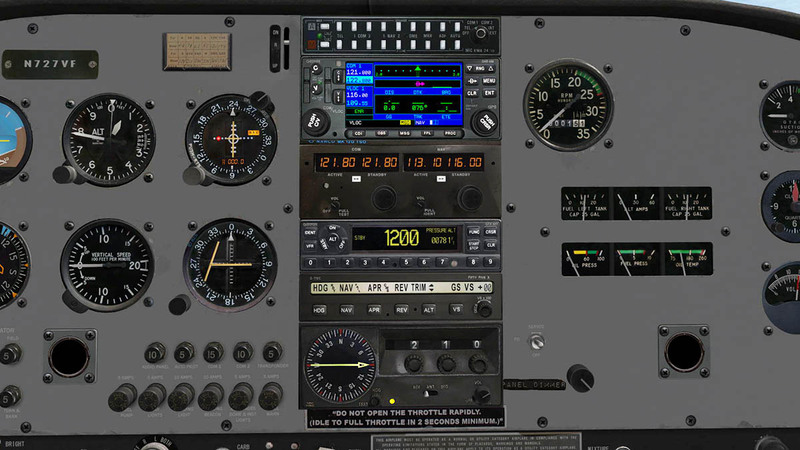 A large VOR OBS CDI (course deviation indicator) covers the instruments on the pilot's side. 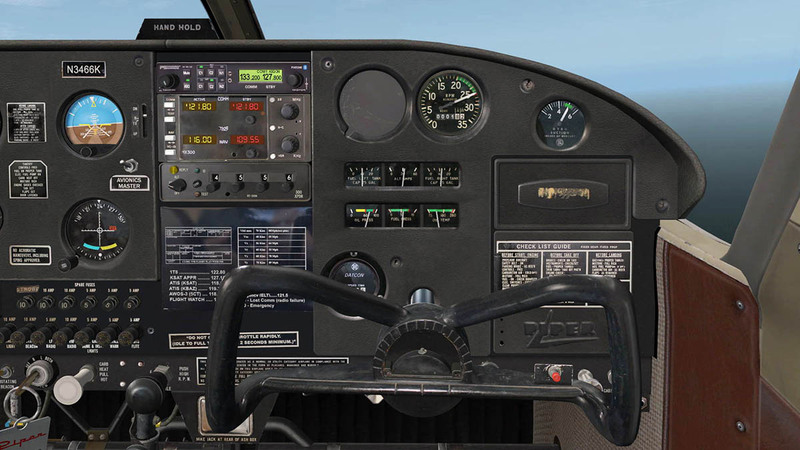 The Co-Pilot's facia is more the same as the Classic version with the RPM (large), Gyro suction dial and those six block gauges. The hobbs meter is the odd instrument. Central equipment stack in the original is basic. There is an interesting PS Engineering PAR200 Audio Panel top that looks like it was future fitted. It has a built in COMM 1 function. There is a "Bluetooth" function on the real PAR200 and this is simulated by an audio file that is already inserted or your own choice of music... Then below is a classic TKM MX300 Com panel with Comm 2 and VOR 1 frequency adjustment that is slaved for use with the OBS (usually VOR 2). You have finally on the bottom a lovely RC RT-359A 300 XPDR Aircraft Transponder, really old and authentic. All radio equipment looks great and aged and are all highly realistic. 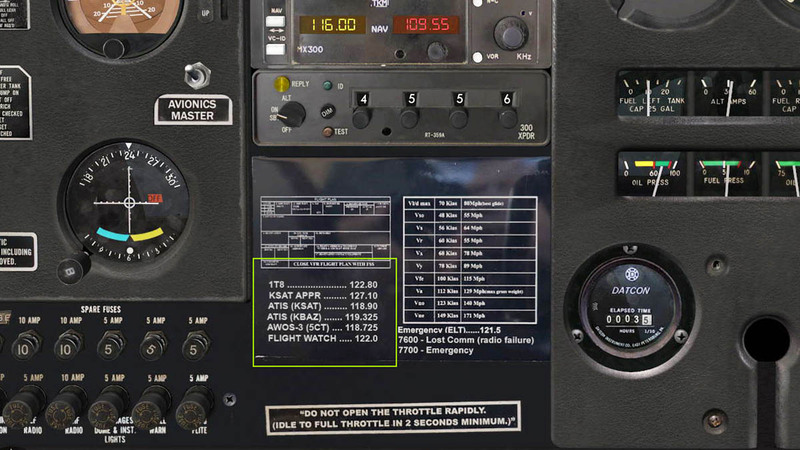 Two clever features on the Original version include first is that you can set your own text on a placard for either local Radio frequencies or vRef speeds on the lower panel (just make a .png image to replace). 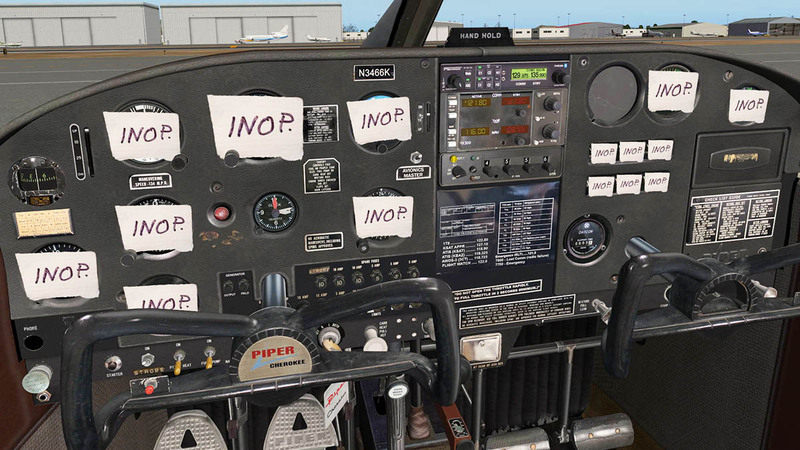 Second is the feature to put "INOP" stickers over instruments to allow training pilots to practice skills with “Partial Panel” flight . 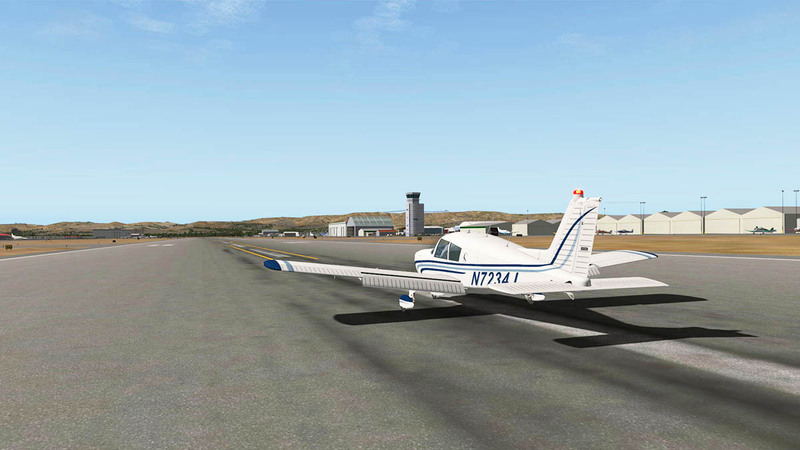 There is a trick you can do the Original aircraft as well. 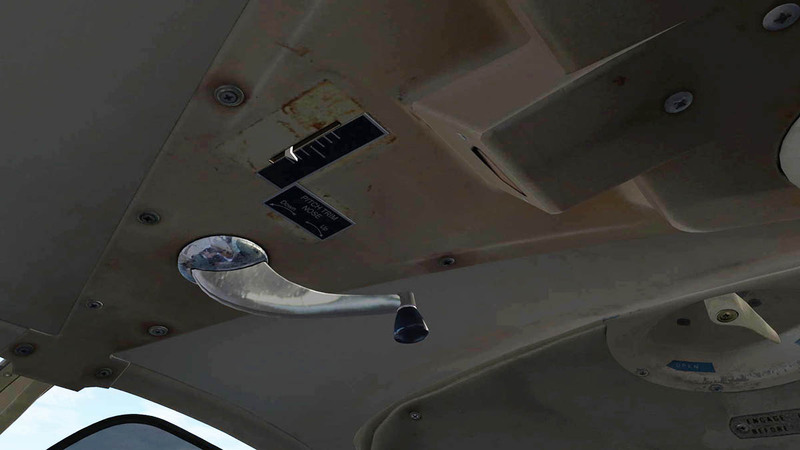 Real-world pilots of the Cherokee 140 jam a small object under the flaps lever during cruise flight? Why would they do this? Well -- this way the flaps deploy by about 1°. 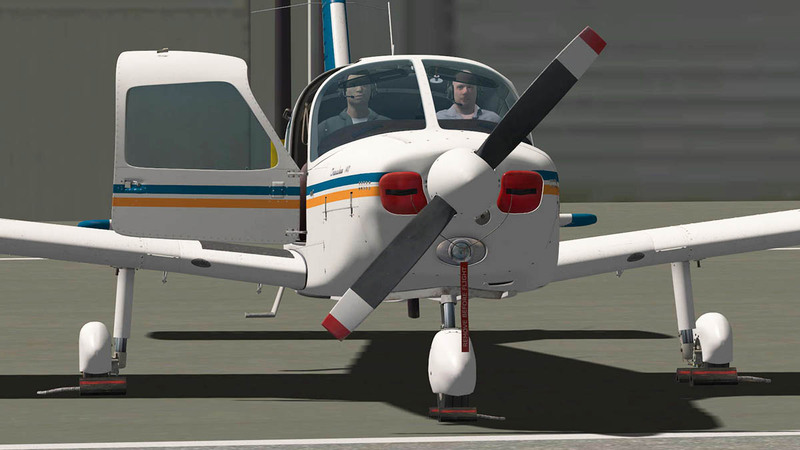 To compensate for the small extra lift generated by the flaps, the pilots trim down the aircraft a bit, and this results in a slightly increased cruise speed (2 to 4 knots). 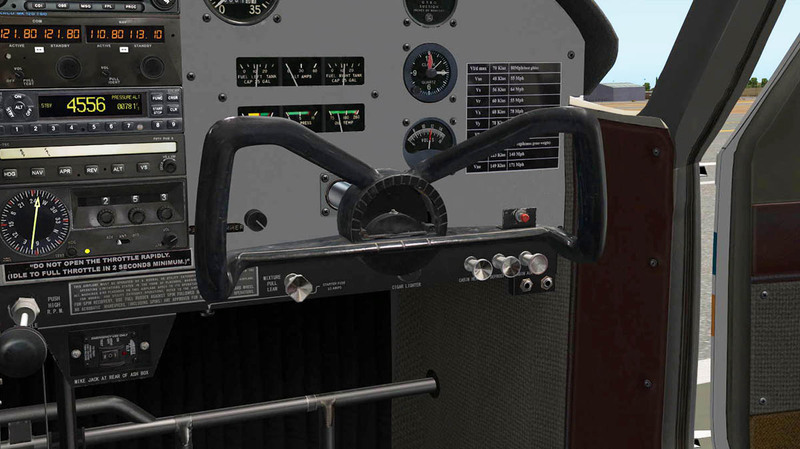 You can do the same as the aircraft offers you a pilot's log book in the cockpit which you can click to put it under the lever. 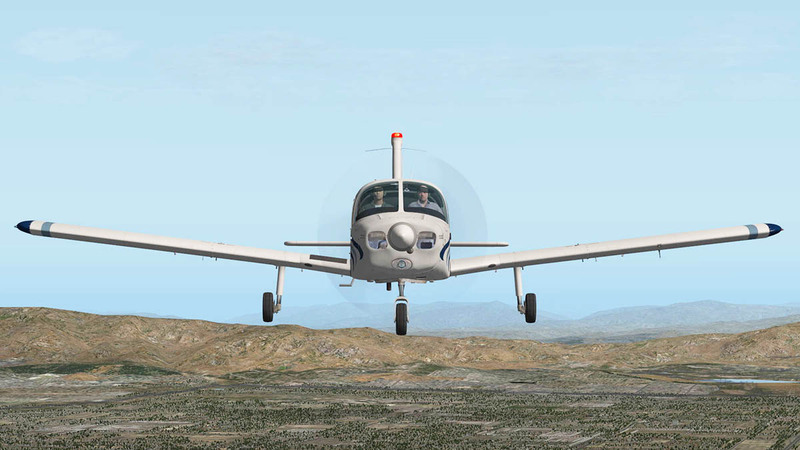 Then trim down a bit and you are a little bit faster without touching the throttle. Just don't tell the NTSB. The donor aircraft is a Texan registered Cherokee 140 N3466K, built in 1963 and still flying and working as hard today as then. 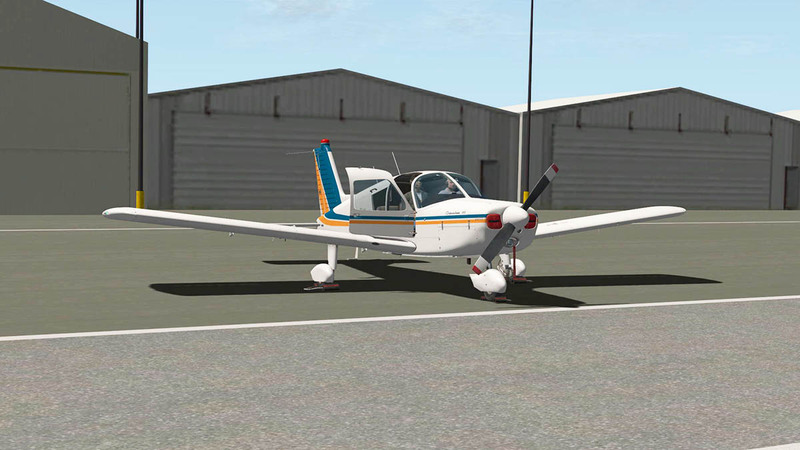 Based in Bulverde Airpark, (1T8) San Antonio Texas with a build serial number of 28-209040, and is powered by a Lycoming O-320-E2E engine with 150hp. 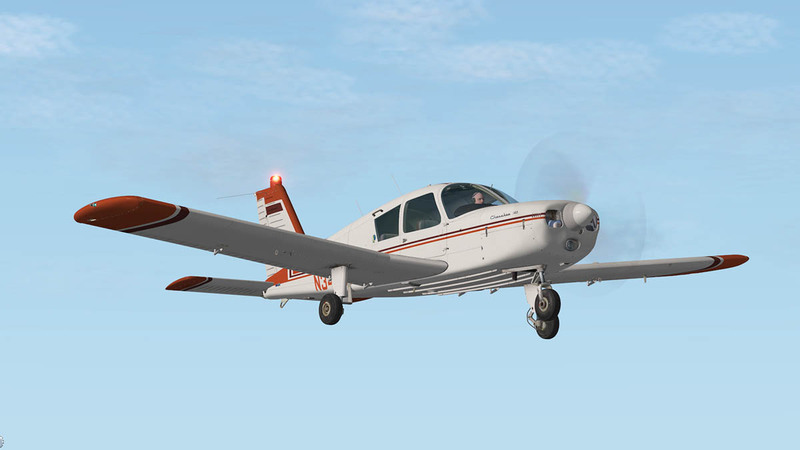 The full history of N3466K is in the manual. 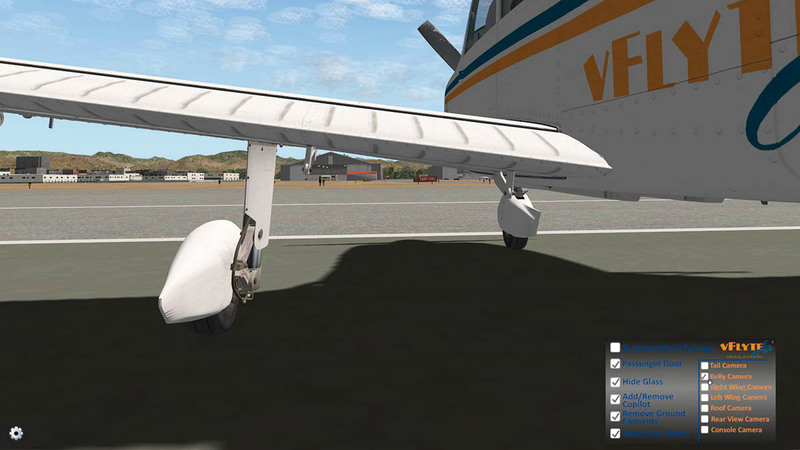 Smaller detailing is really good, note the worn fixed-pitch two-blade propeller. Power is a switch and the turn the key to start. Fuel pump on and a few pumps of the primer far left and press the starter... You will need to give the aircraft a little throttle to start then when it catches let it settle down to a rhythm before returning the throttle to the idle position. 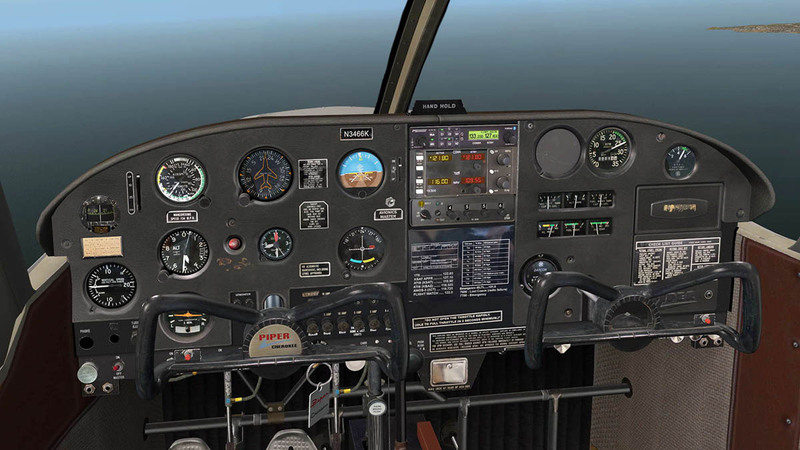 Starting from hot or cold is different as with the real aircraft and age, which is very authentic and it works and feels really clever, and thankfully not as mindnumbingly annoying as starting with the REP packs by SimCoders. 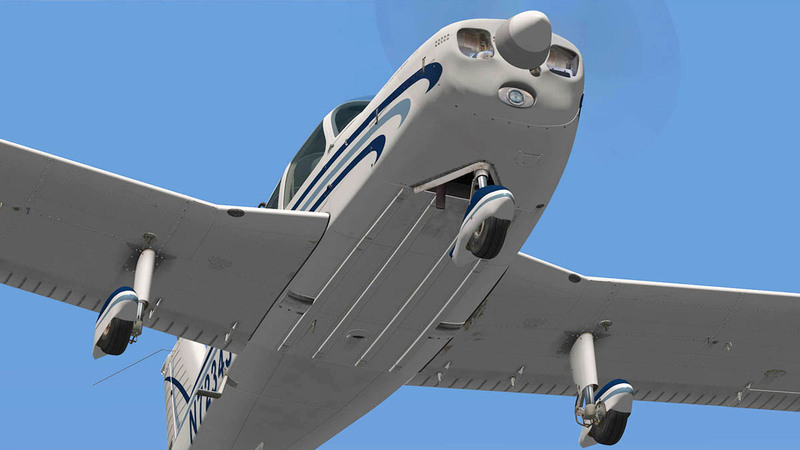 Starting and running sounds are first rate, They are custom sourced from the donor aircraft N3466K and are perfectly captured internally and externally. Open the side window for the full 3d sonic experience, and I like great detailing like this to enjoy the moment. As mentioned adjust the air-vents for your best cooling effect (or a small fan on the desk!). A push of power and undo the brakes and your moving. The 140 is great under taxiing with good steering and just the right place of power to keep up the right ground speed, no hunting the throttle is one moment going too fast then too slow, you can find that sweet spot but a little more rev in the turns helps the pace. The above window blind does intrude into the view a little, but you soon find that relaxing place to feel comfortable in the aircraft. 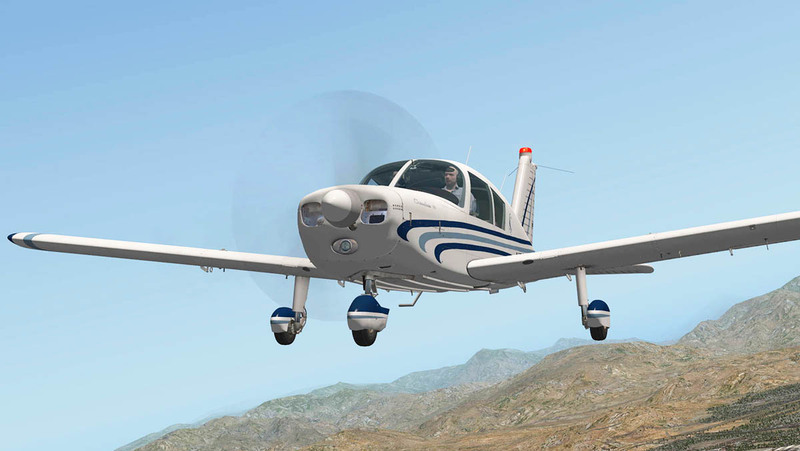 Laminar Research have created a tutorial to create custom 3-D Effect Propeller Disc effects and this feature has been used to a great advantage here. Both from a forward view (look closely between each of the above images) and the added dimensional depth to the spinning propeller from the side. 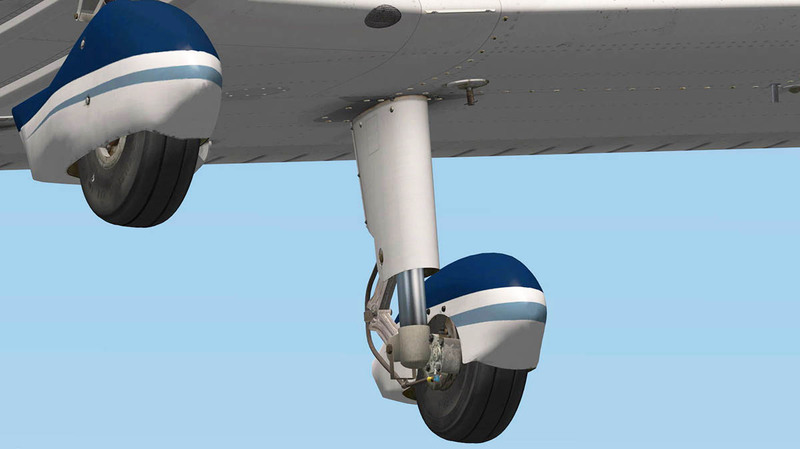 It really is very realistic as you add or decrease the power as the propeller shimmies with the forces of rotation. These same effects are also used on the wheels, that show blurred tyres at speed. Clearance acknowledged and you are ready to go. Speed set to 2500 rpm and into the green zone and let the 140 build to 95 knts then rotate smoothly. 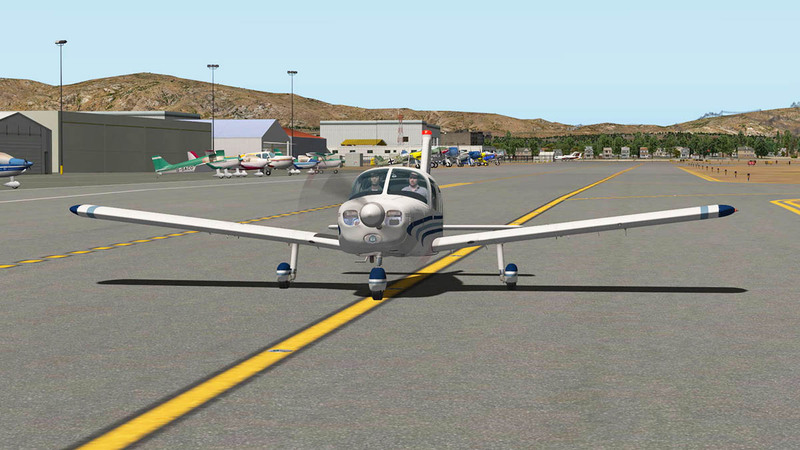 It is very apparent from the moment you lift off the runway that the aircraft has sublime flying qualities. 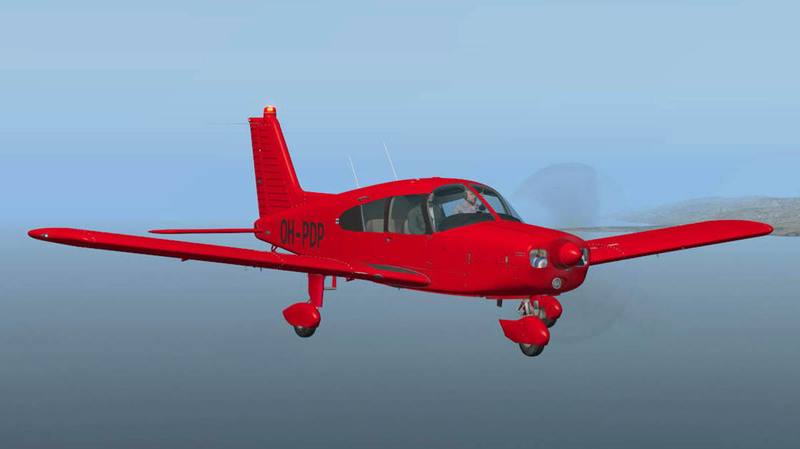 One of the primary objectives of this project was to not only to replicate the performance and flying characteristics of the Cherokee 140, but to really get them almost perfect. 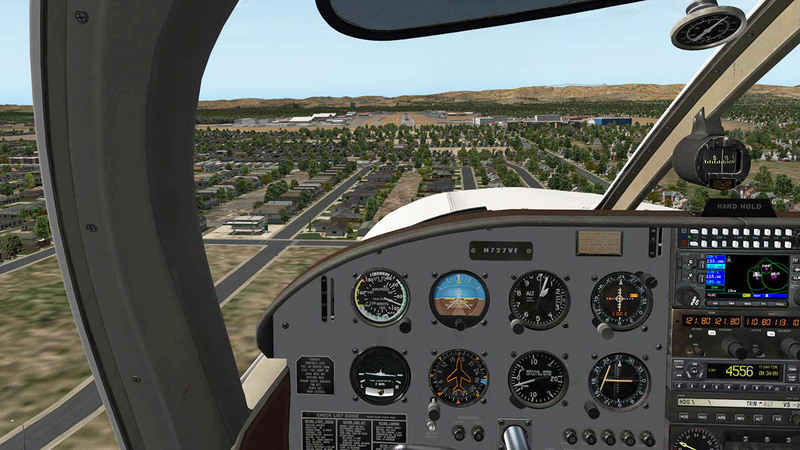 One reason was personal for the developers themselves so they could fly the 140 without the real world costs involved, the benefits are that you get the same highly refined flight model to use. 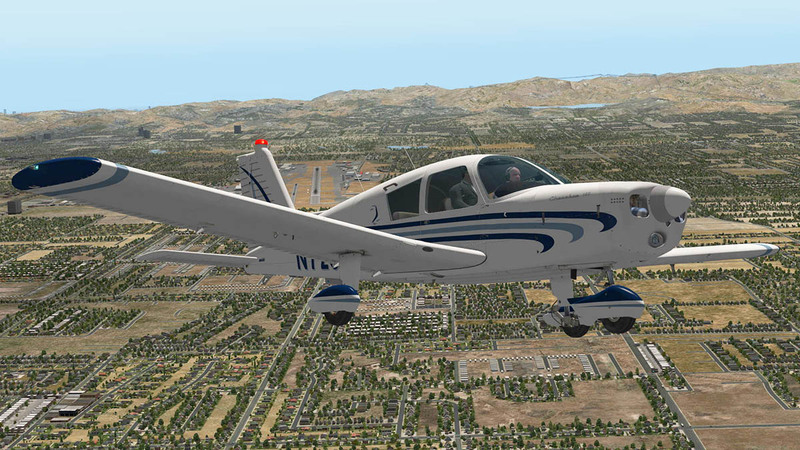 500fpm is a nice rate of climb (631fpm is the max) and the aircraft feels so balanced and controlled via the yoke. 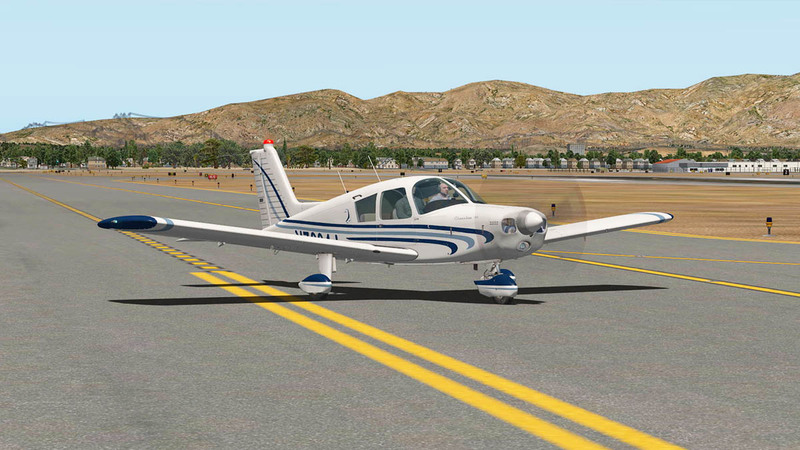 Your confidence soars as you know the aircraft is so good under you, this is certainly a great handling machine and the perfect trainer. 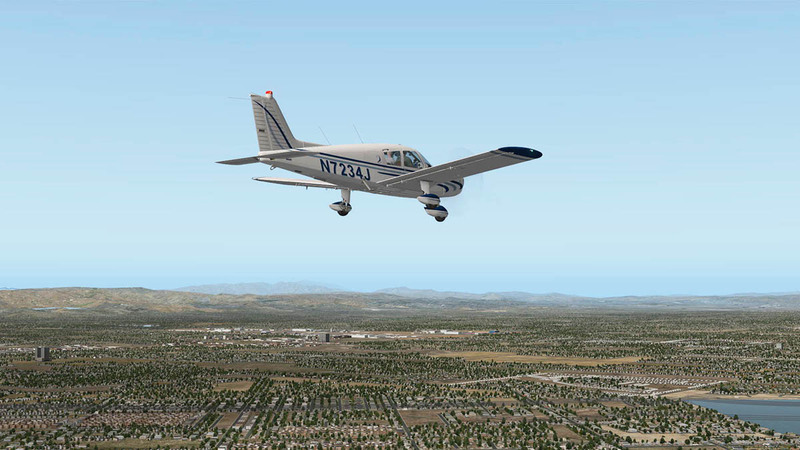 Inputs are small but responsive, roll is nice and curved climbing runway departures are nice and smooth and in this case a back turn and track over Van Nuys... smooth. There is a two way exactly replicated as the original switch (Off - Servos) to activate the S-TEC 55X autopilot and it comes in with a bit of a thud. 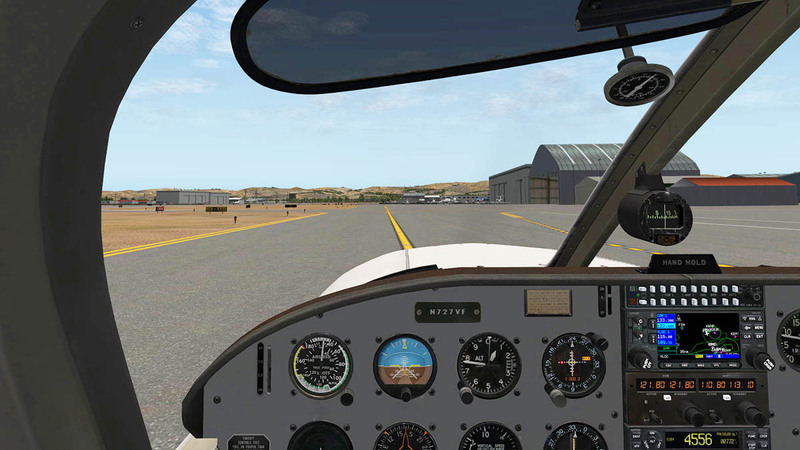 Setting the V/S (vertical Speed) is easy, just a + or -, and I used 0 for level flight (No manual at this point so I am guessing that is how it is used) but that works fine. 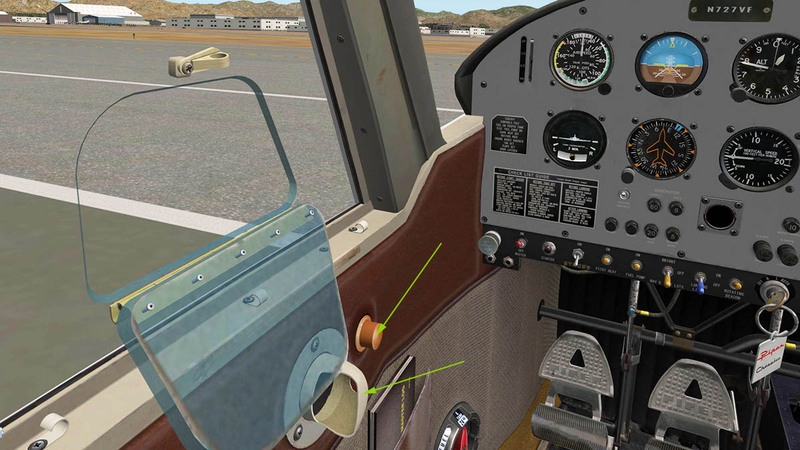 There is also a CWS (Control Wheel Steering) manipulator on the right-side knob. 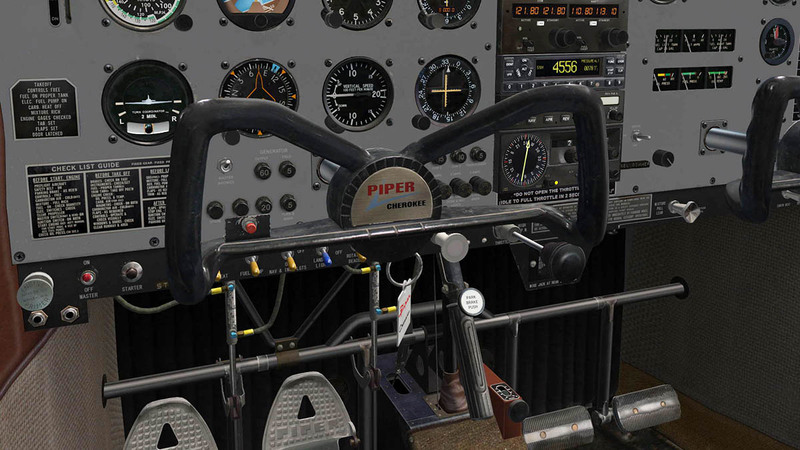 You can click and hold the CWS manipulator and over-ride the autopilot servos, which allows you use the yoke to reposition the aircraft's heading and/or altitude. 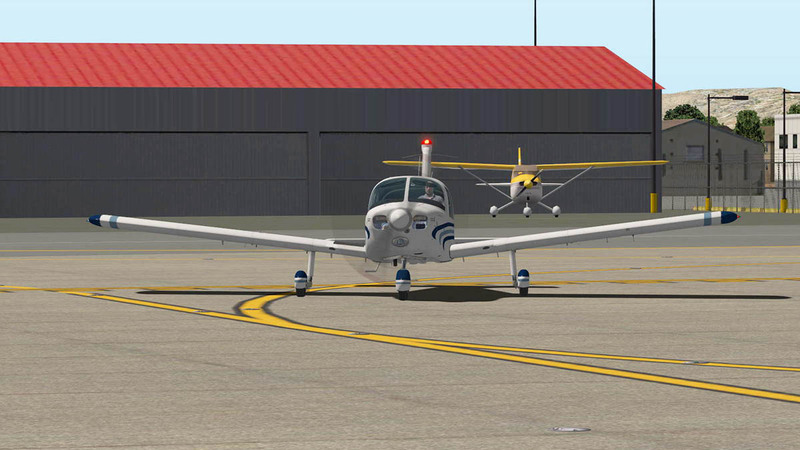 When released, the autopilot will capture and then hold the new heading and pitch. 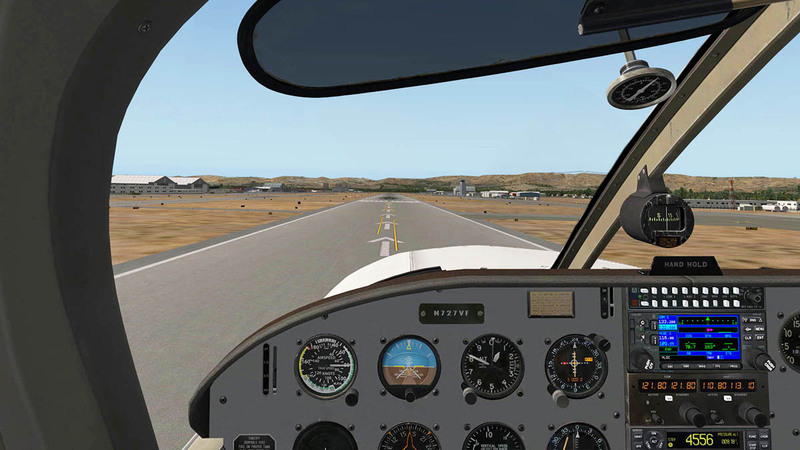 You will need to set up a keyboard sim/autopilot/control_wheel_steer command to use this function. Cruise sounds are excellent and not at all without that constant drone which many are lately and are boring. Top Speed is noted at 130knts and a cruise speed of 112-115knts which is sloooow, and if you are heading to Las Vegas then a packed lunch is a great idea. Range is 455nm with a fuel capacity of 36gal. Frameweight is good. 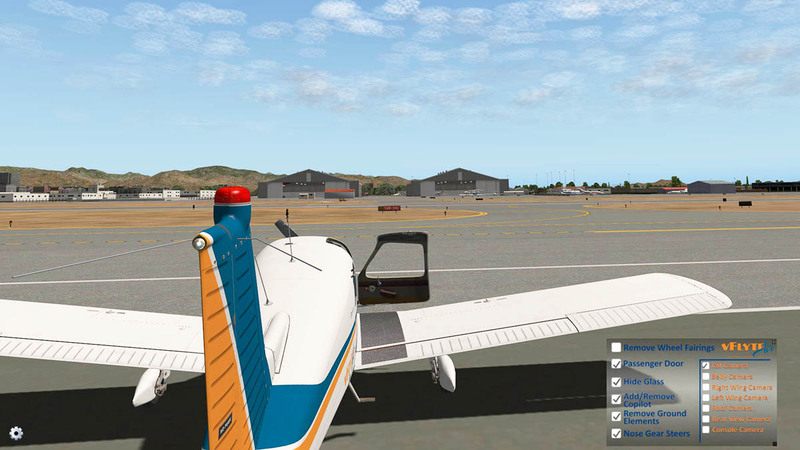 I flew all around Los Angeles with huge autogen switched on and the frame-rate stayed above the mid-twenties, so in normal scenery you would be above average. Underside detailing is very good. Closeup on the gear and you can smell the grease and feel the worn aged brake piping, great hub and strut construction and all units are perfectly realised. Wing detailing is also spot on. 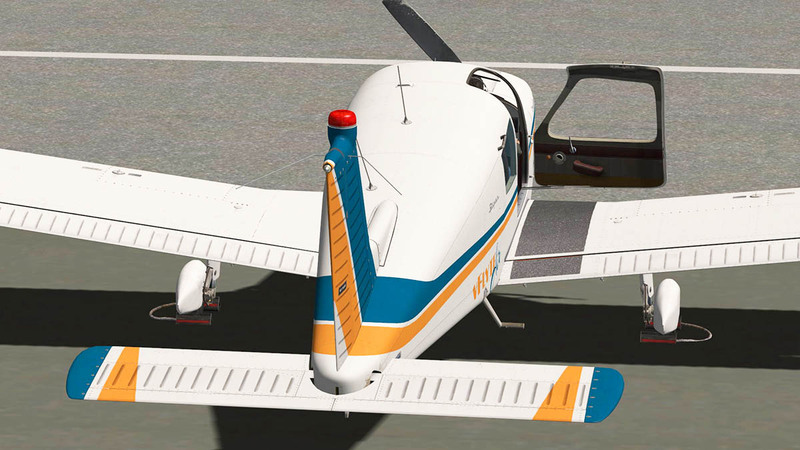 The aircraft has tuned modified NACA 64(216)-415 laminar flow airfoils for perfect performance and airflow, and you feel the lift and control as you find the runway. 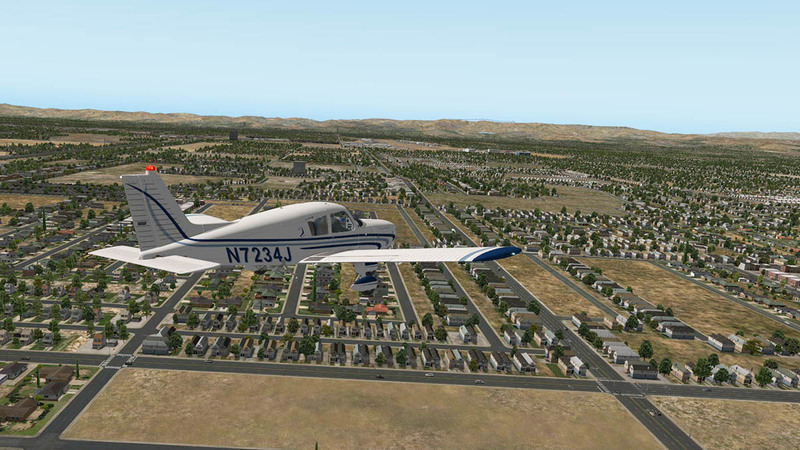 I was very confident in finding the right rate of turn and the perfect bank into Van Nuys Runway 16R . Feel through the controls is just sooo good, you are as one with the machine and enjoying the intimate small control movement. Flaps are four position in "Up - 1/3 - 2/3 - DN" and highly effective, get the approach speed right and there is only a very, very slight lift as they extend... smooth. 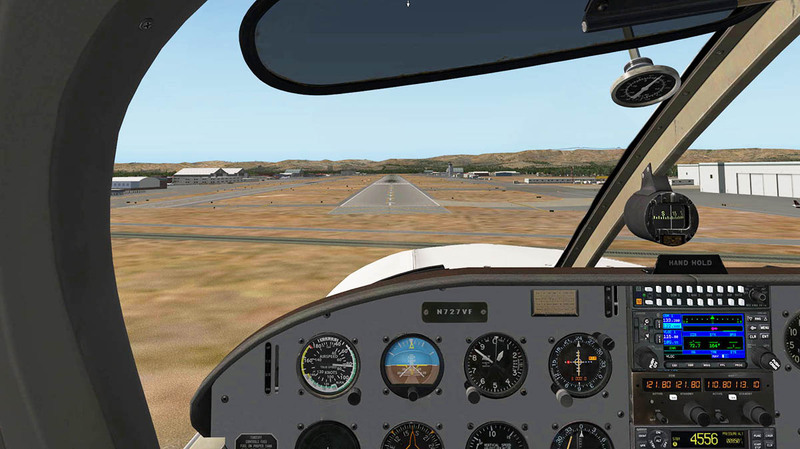 Still so much control and you can easily set up the slight bank approach with ease. 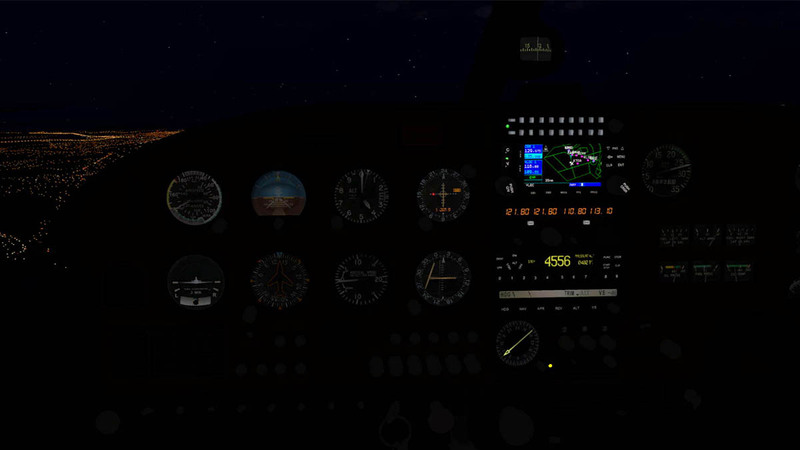 Approach speed was 90knts, but that is too high, and on my second landing I revised it down to 80knts and that felt far better. You wind off the altitude with ease and throttle to control the descent to that lovely slight flare landing that makes you smile for a day after. But watch the brakes. Throttle at idle and the 140 still takes time to rub off the excess speed, it runs and runs, and you are very tempted to touch those brake pads, but don't until you are right down in speed unless you want to end up in the scenery. You think the Cherokee is never going to slow down, it does but not with giving you a little moment there. 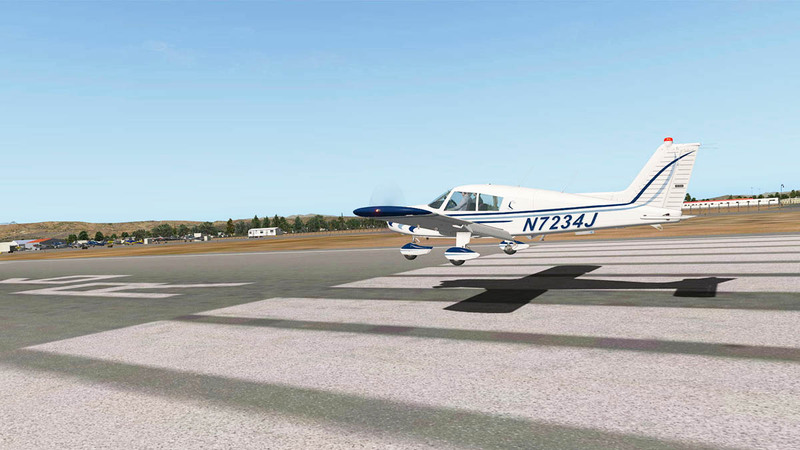 Transition from the runway back to taxi is very good, as noted the aircraft is very good on the ground as well. 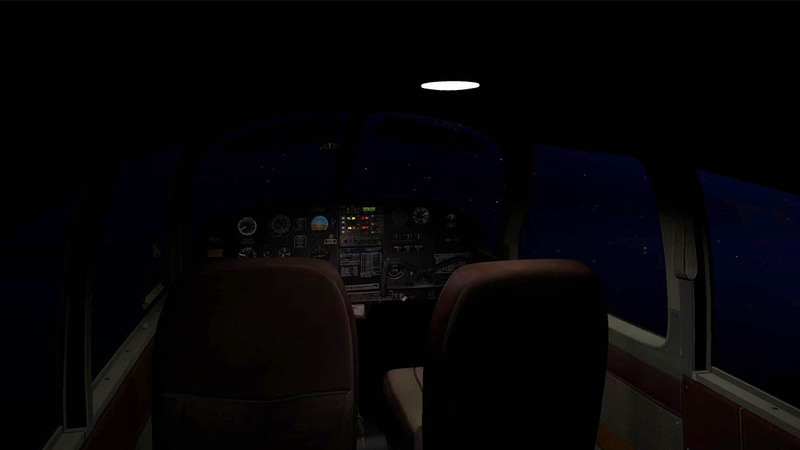 There is a large overhead light that can switched on or off (no adjustment) and the instruments have weak but authentic back lighting. There is a panel light adjustment and it is very good, from bright to dark. On the Original version it is as much the same, but the tone of the darker panel adjusts the mood of the aircraft to something completely different than the Classic grey version. I like the older worn lighting of the TKM MX300 Com panel as it just faintly glows in the dark. External lighting is good on both versions. Single landing light in the nose and a huge red beacon on the top of the tail. 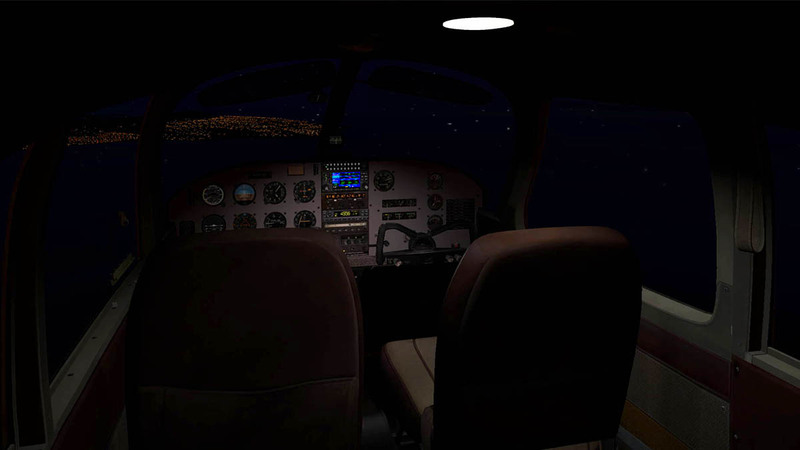 All lights are “parameterized” (spill lights, directional lights and spot lights) to provide more reality including the beacon with a custom flash sequence. The interior looks good from the external view when it is fully lit. Great ice and rain effects when the weather gets cold and snowy. 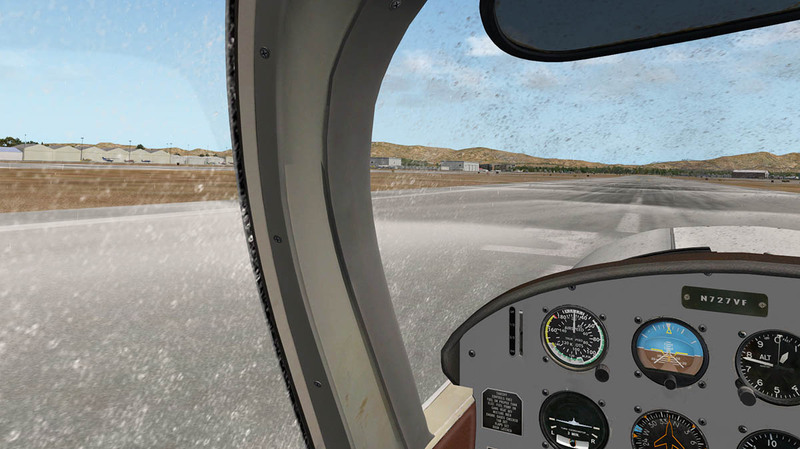 The view is well done, but there is no running up the window droplets animation and they just pop out of view and then pop back in again on landing. 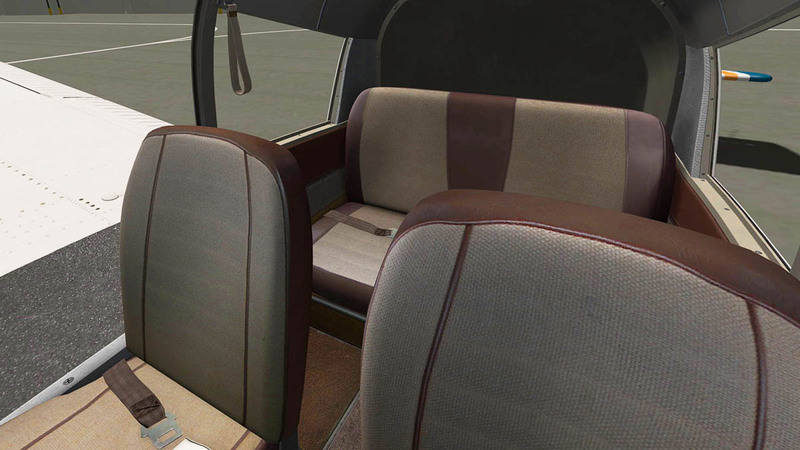 There are six liveries in the Classic package and all are nicely spread around for the various countries and all have very different flight themes from the business like to the outright garlish. 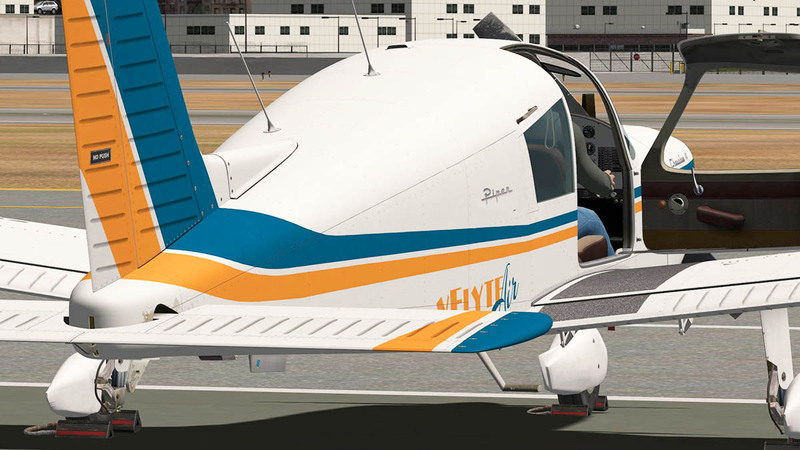 VFlyteAir's livery is the default. All are 4K HD and high quality. 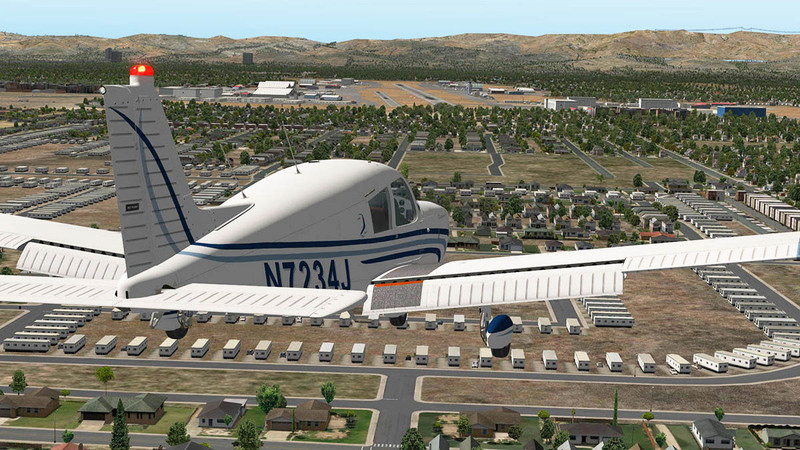 The Original version comes with seven sets of liveries including a white blank and the N3466K livery as default. 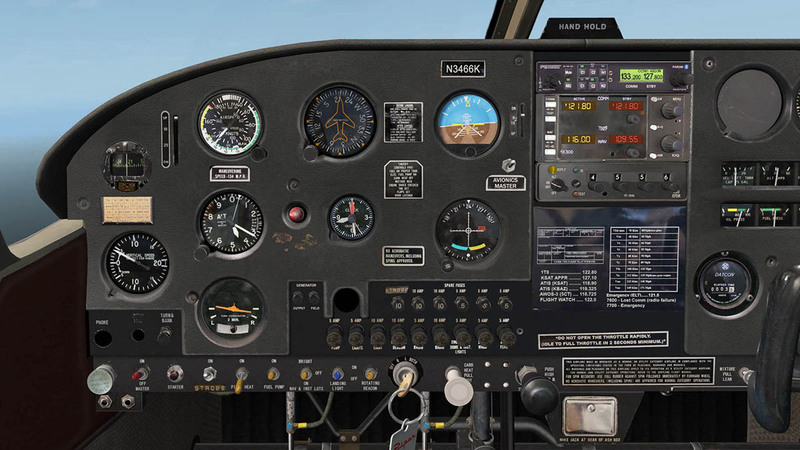 I think it is that bland grey instrument panel that gives the aircraft a blank first look, certainly the Original version panel is more interesting. Once you get past that you start to understand that this aircraft is much more far interesting than it looks on the surface. In fact it reveals itself the more and more you experience depths of its character, and the more you go down the deeper levels of its intricate design and features. 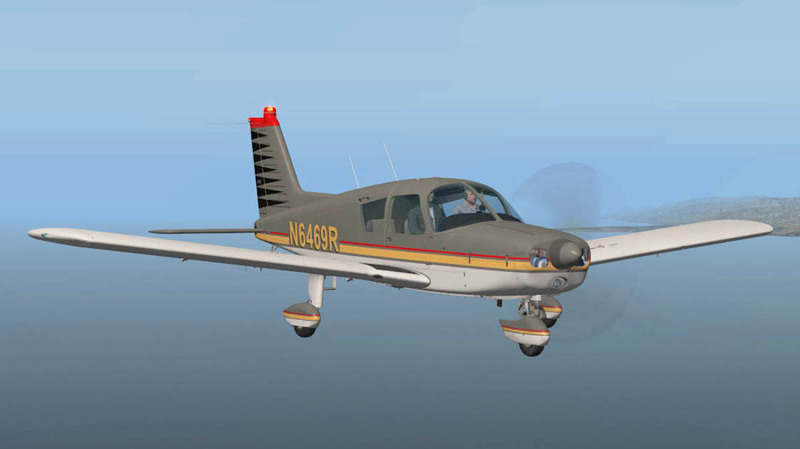 And that makes the Cherokee 140 a very interesting machine. Detailing externally and internally is extremely good once you really look closely at the design work, everything works in vents to lights to every switch and button... so much depth in design. 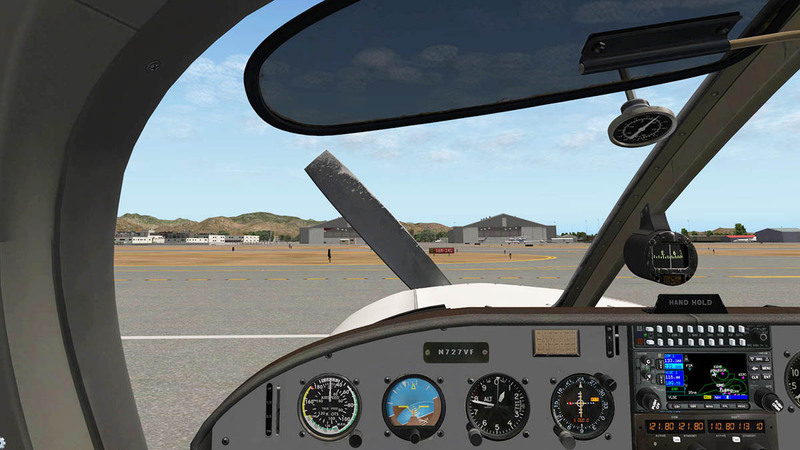 A big feature list from vibrating and shaking items, propeller effects, customised start-up are almost mostly hidden but still also very clever and functional to add in on to the overall experience of using and flying the aircraft. Sounds are custom from the donor aircraft and very authentic and put all these ideas together and the aircraft comes really alive. There are also great training tools for learners as well. 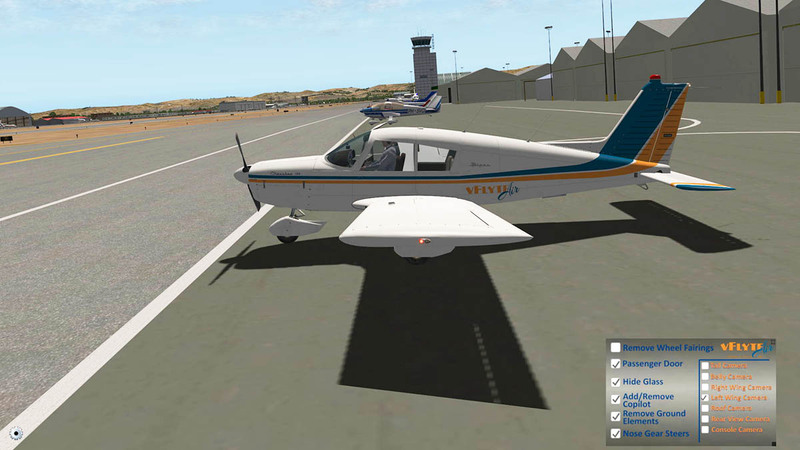 The flight model is extremely good, and a perfect tool for training and learning how to fly an aircraft well. 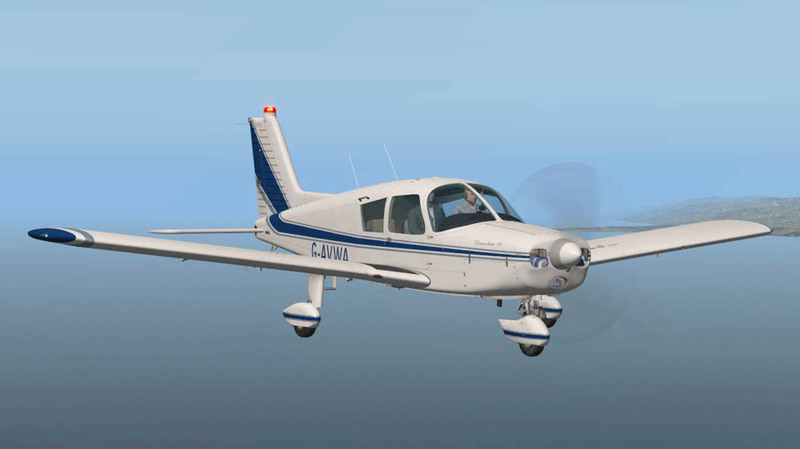 So for new pilots wanting to get their wings this would be the perfect aircraft in which to start that journey. 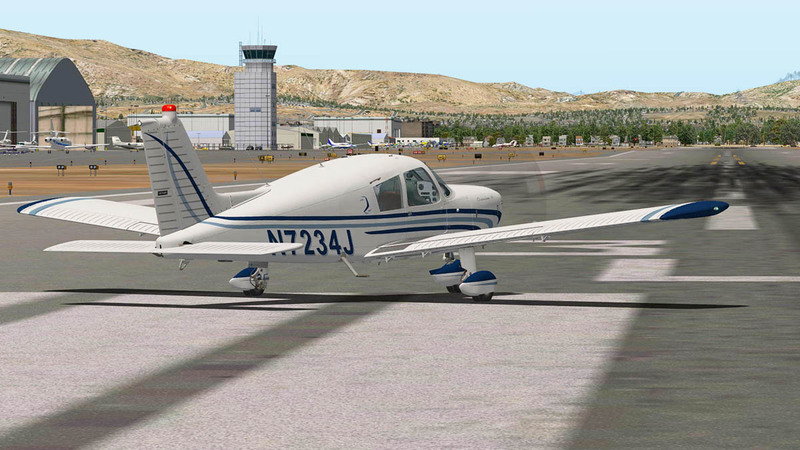 The choice between the VFR Original or the IFR Classic is really to taste and use. 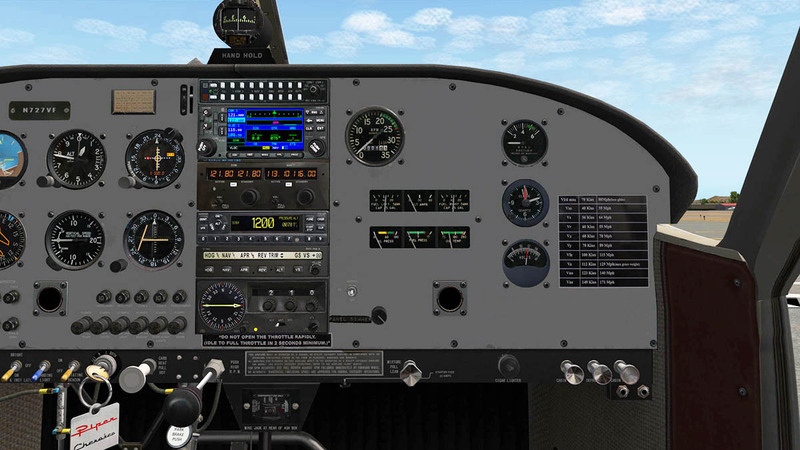 I like the functionality of the Garmin gps, autopilot and VOR direction instruments but find the grey panel bland. 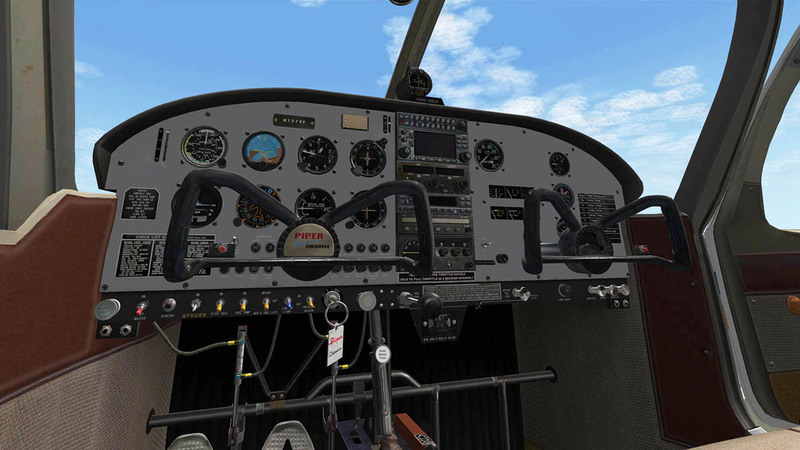 The Original has a great panel and is a good manual flying aircraft with those great authentic radio items and there are a few more added special features not on the classic, so it is a really hard choice. 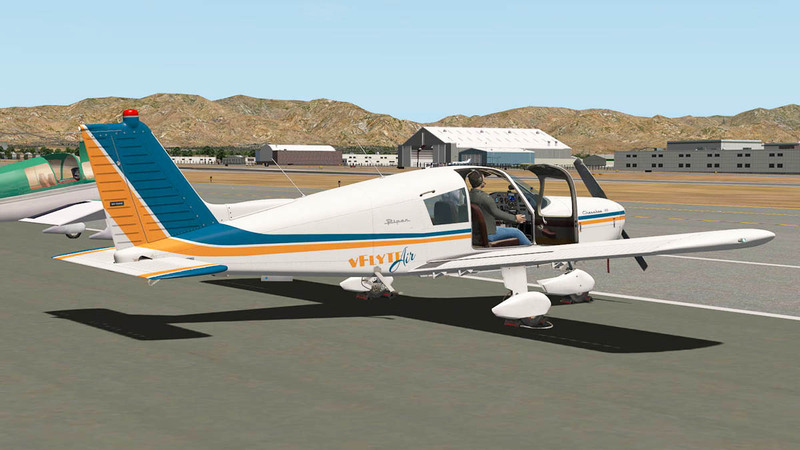 As I do fly a lot of VOR to VOR routes then the classic would be my pick, but I am really in love with the idea of just one example of a real world aircraft. I hear a glass instrument version may come later as well. 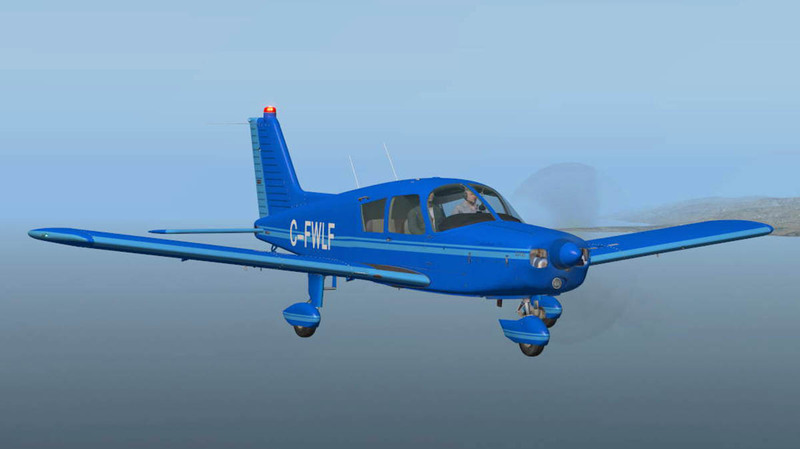 So you start in one place and later find yourself putting this aircraft into the great list of X-Plane aircraft to use and fly everyday. 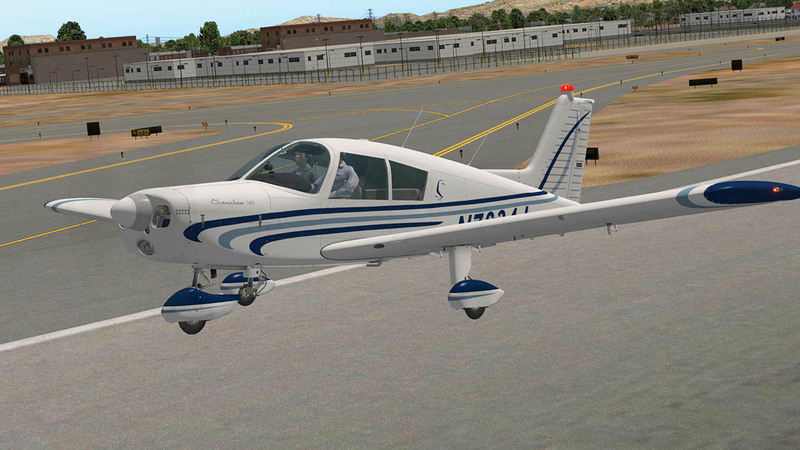 It is not a flashy aircraft and it is slow, but it does have a huge amount of flash when you use and fly it regularly because it is so very authentic to the original donor aircraft, so for many users here it will quickly become a serious favorite to fly, practice or train on... in other words it is extremely good, if not a great general aviation aircraft. 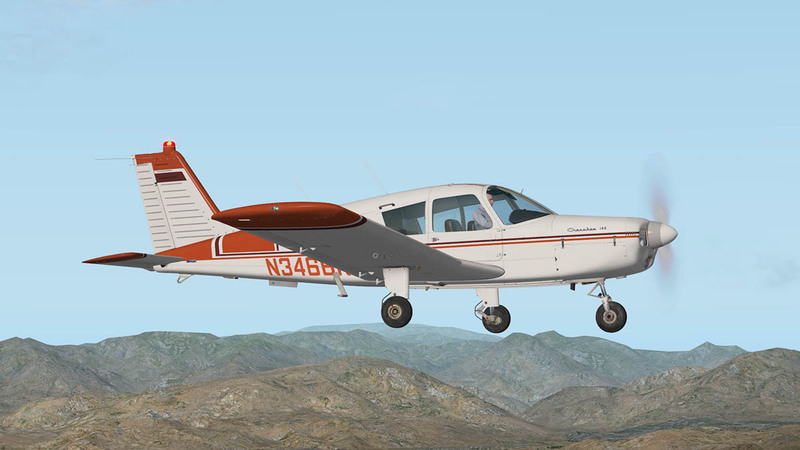 It was our goal to make the Cherokee 140 as real as we could within the limits of X-Plane. Therefore, we created a special plug-in controller engine startup procedure that we think adds greatly to the realism of the model. 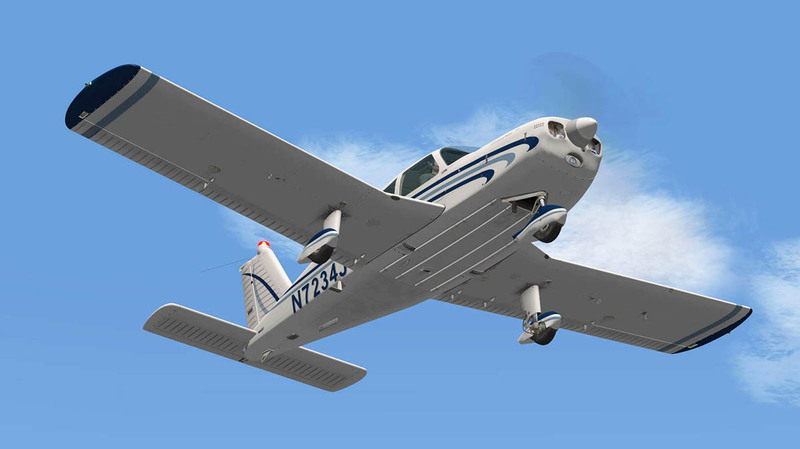 When is the last time you jumped into an older-model airplane on a cold day, and the engine started immediately? 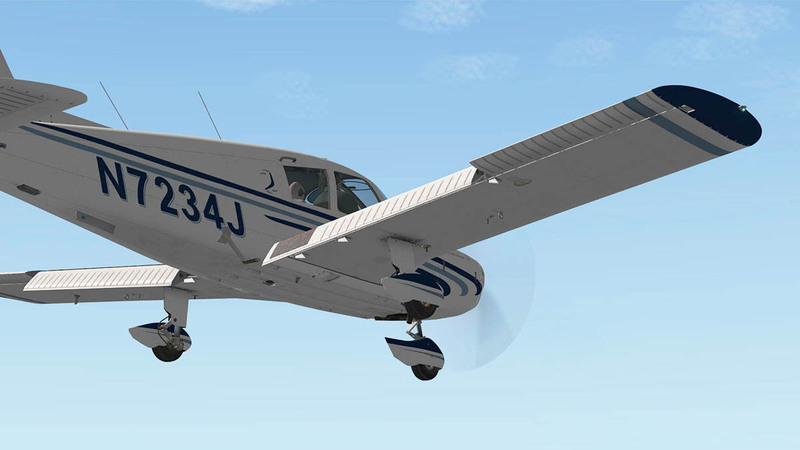 Let’s face it, most older airplanes are a bit hard to start, especially when the weather is cold. 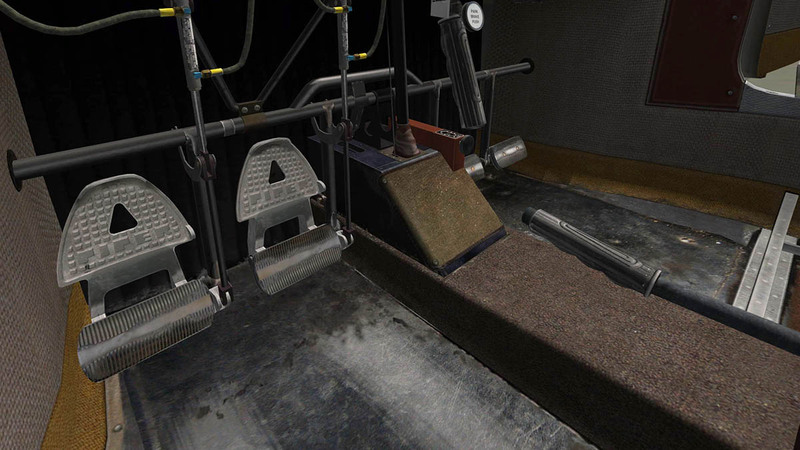 We’ve modeled the 140 so that when the engine oil temperature is cold, the engine is harder to start. Conversely, if the engine is already hot or warm, it will be much easier to start. 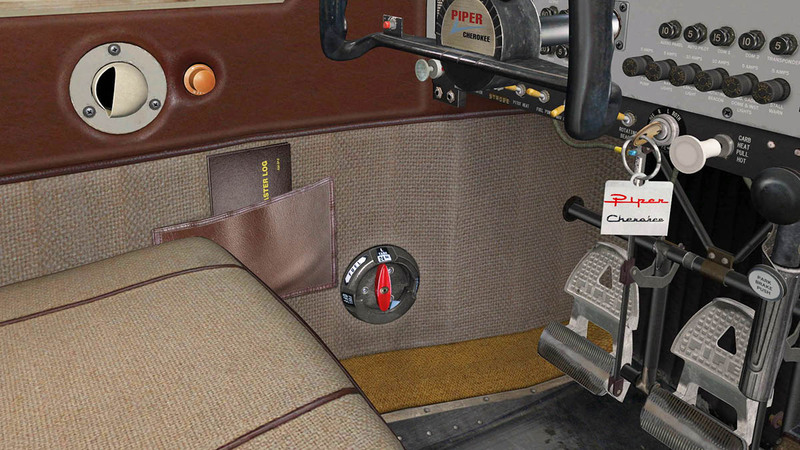 When you first load the Cherokee 140, the ignition key will be located on top of the glareshield. You must click on the ignition key to place it into the ignition. The engine will not start without the magnetos being ON. 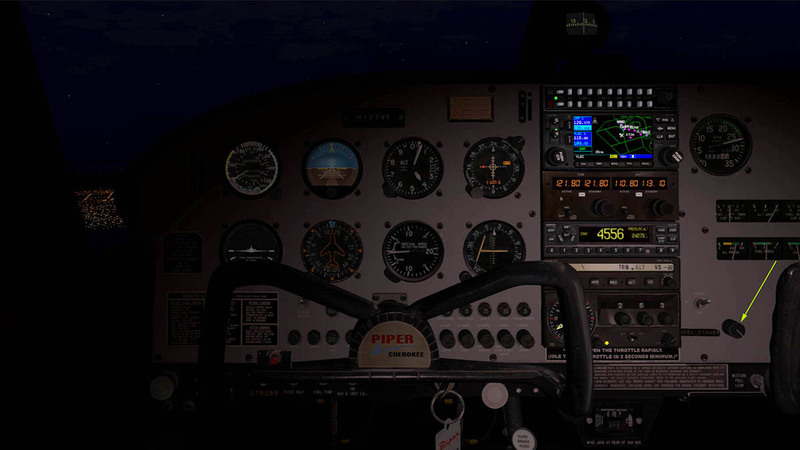 You must open the throttle by at least ¼” before the engine will start. Mixture should be full rich before starting. 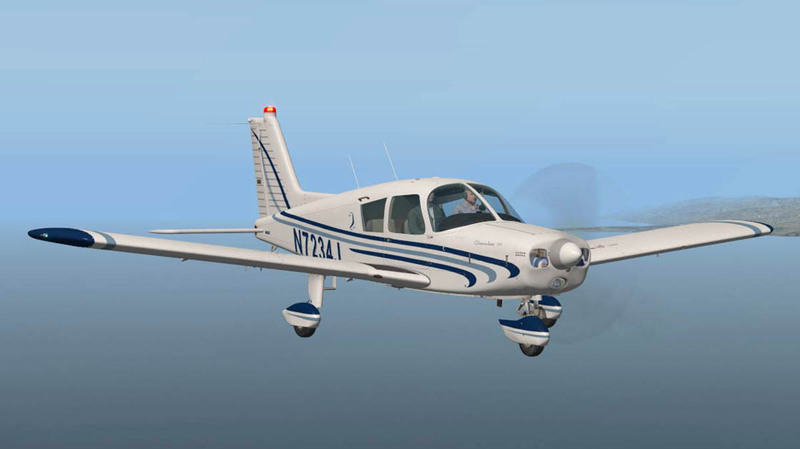 If the engine is quite cold, it may take two tries on the starter to get the engine started. 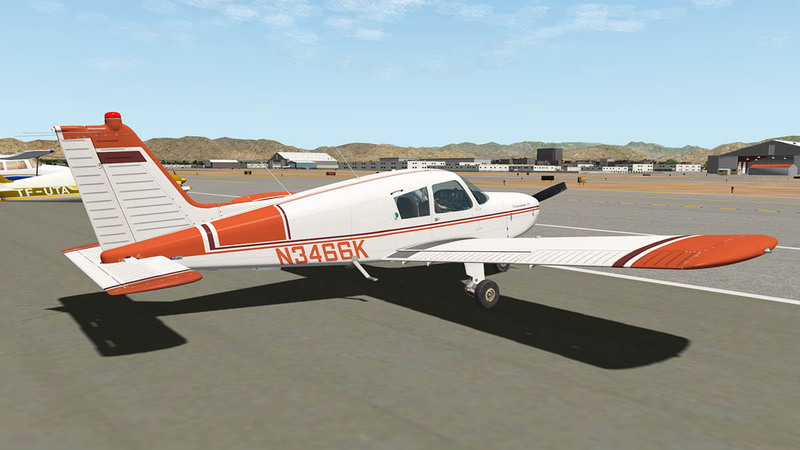 Download for the Classic is 731.60meg and the unzipped file deposited in the "General Aviation" X-Plane folder at 731.60mb. 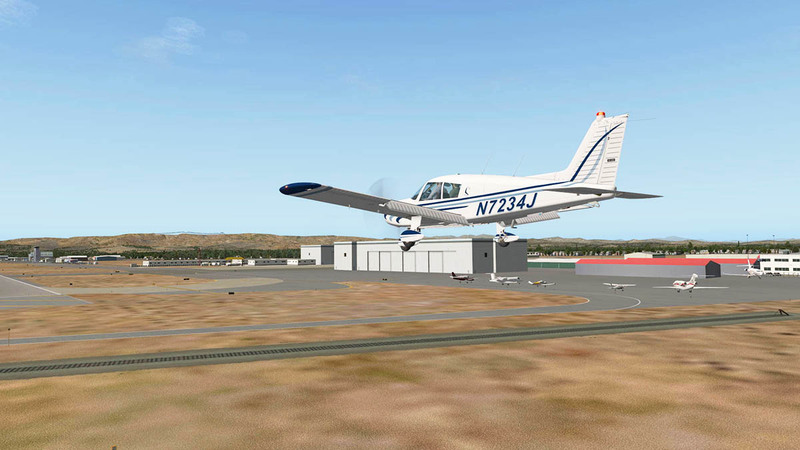 Download for the Original is 314.10meg and the unzipped file deposited in the "General Aviation" X-Plane folder at 314.10mb. Addons: Saitek x52 Pro system Joystick and Throttle : Sound - Bose Soundlink Mini - small fan for cockpit air. Great Review! I do have a hard time to understand why they are charging 21-22 dollars for each model. I would expect the it to be either in one package or spend only a few dollars for the other model, not 21 dollars for the exact same plane but with a slight variation in avionics. If you buy 2 variants as package, you only pay $32 instead of $43. It is generally a nice plane but somehow the didn't get the dimensions of the fuselage right. The engine compartment isn't high enough and the windows are also odd. 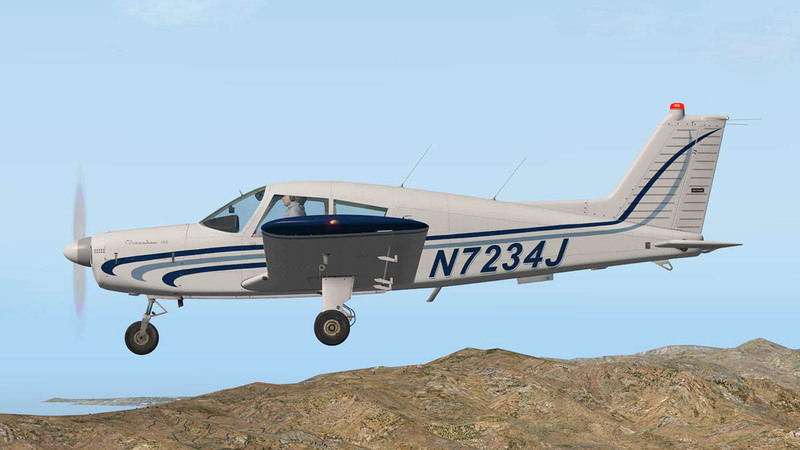 I own a -140 for three years and really know it from every perspective. Also the performance isn't right. Way to good in climb and a little too fast in cruise. By the way: On take-off you NEVER let her run up to 95kts before lift-off. At 55 put gentle back pressure on the wheel and wait for the plane to lift. It will happen at around 60-65kts depending on weight. 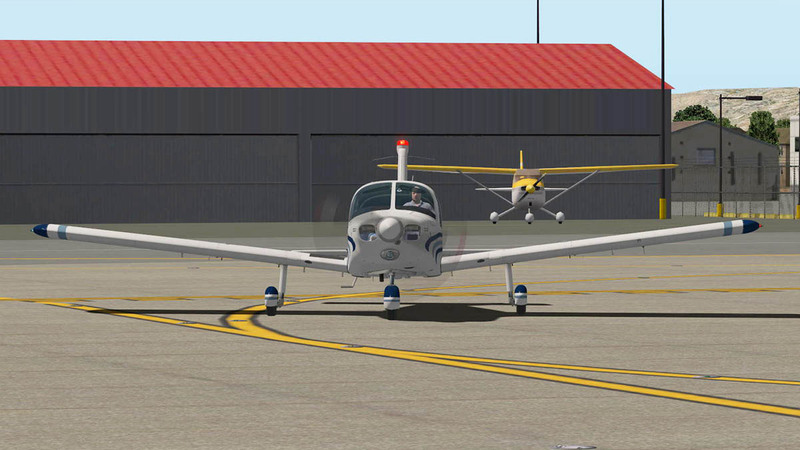 Higher taxi speeds can create control problems and oscillations which might damage the airframe. 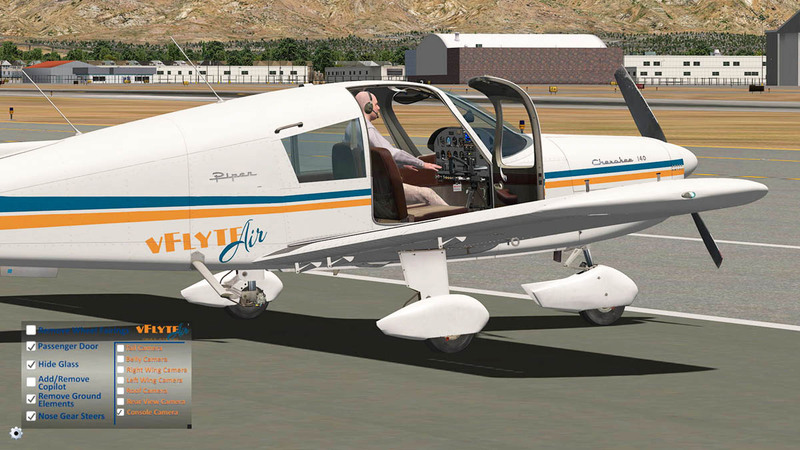 I am new to XPlane but have flown several models of the Piper Cherokee real world. 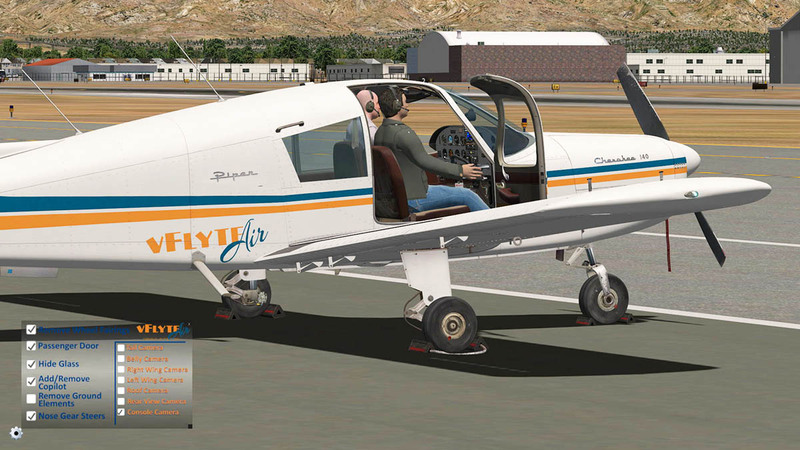 I bought my first XPlane recently, which was the Piper 140 original. 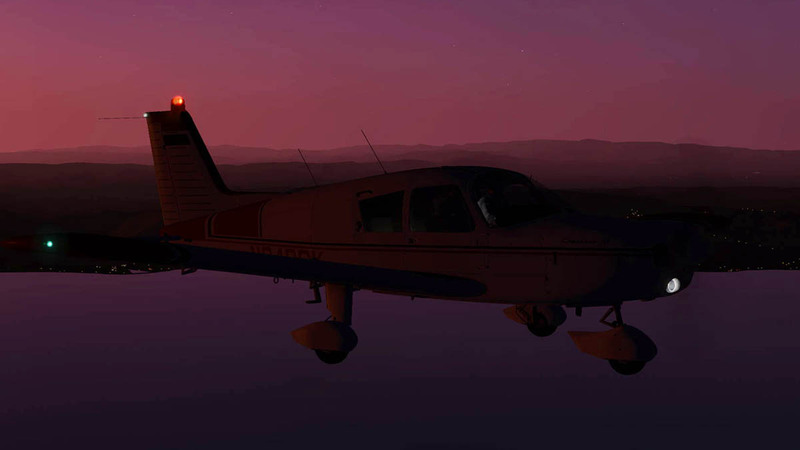 When switching to the IFR version, I see my OBS is slaved to the localizer frequency in the Garmin 430. Why is there no OBS for the Nav 2 in the radio. Is there a fix for this? Yes, it is the newer 140 v3. 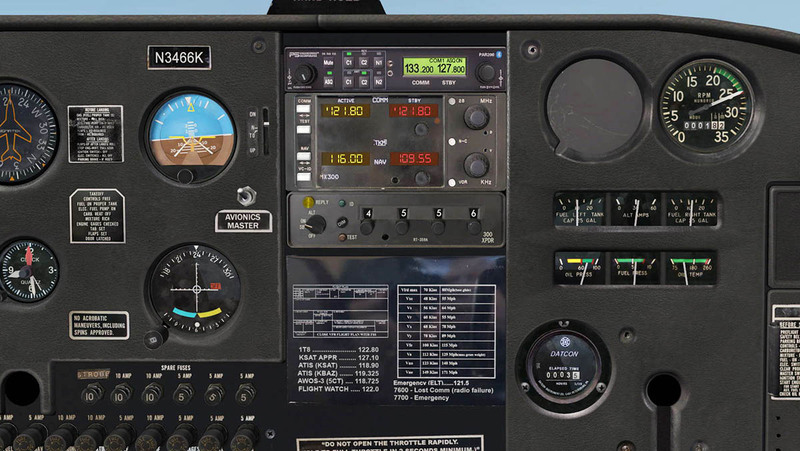 I understand a variety of avionics setups, just trying to understand some details of this one. 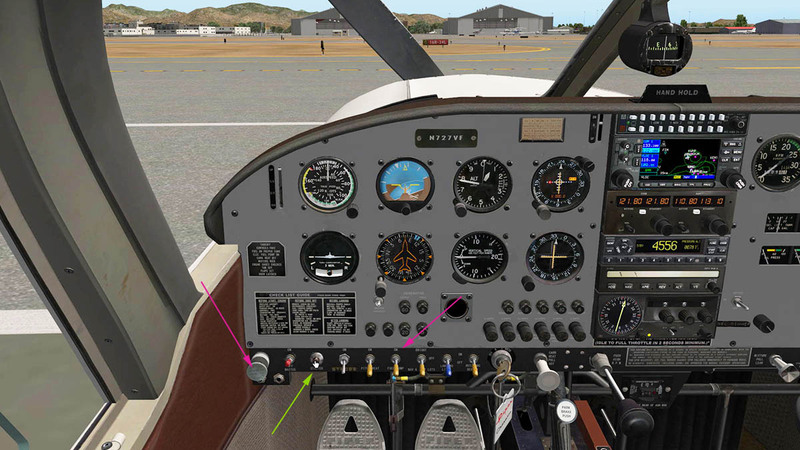 You mentioned the TKM MX 300 Com panel for Nav2 functions, so my questions is, with only one OBS, is there a way to switch back and forth between Nav1 and Nav2 being slaved to the OBS, or better still, is there a way to add another OBS to the cockpit?